One year passed from the Hiroshima earth and sand disaster that occurred by torrential rain of the early morning of August 20, 2014. Thank you very much for your donation and the relief supplies to the affected people, and also thank you very much for the volunteer workers who came to help victims in the stricken area. I called at Midorii district and Yagi district of AsaMinami-Ku, Hiroshima that were the disaster spots on August 29, 2015 while wanting to think about the feeling of the victims at that time again. I report them mainly on photographs. 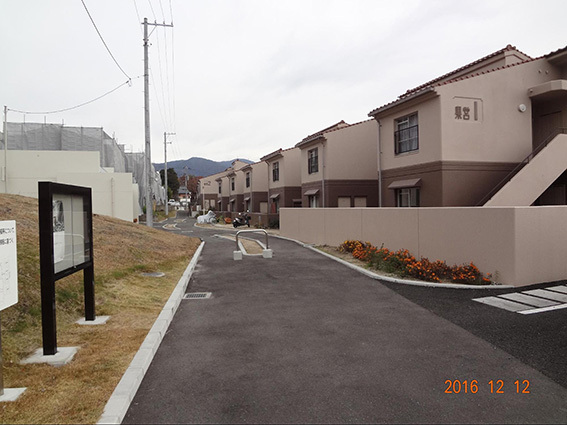 The repair and reform of the half destroyed housing complex under prefectural management was already carried out, and also the construction of barrier preventing landslide carried out sequentially. It was seen the site with vacant land and the house that the person who lived disappeared. The memorial service monument of late people was made by earth and sand disaster, and the former arrangement of houses became of the fresco there and was described. 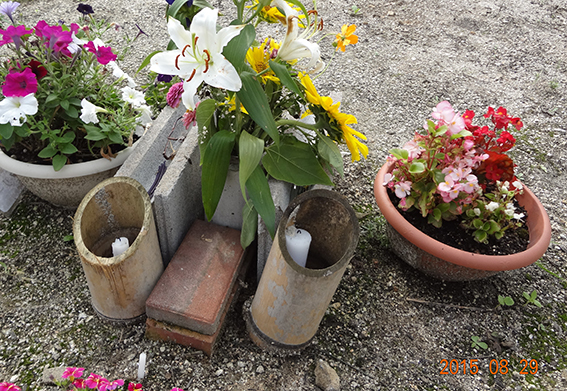 Someone came to the vacant site and she or he will be prayed the late person, and some flowers offered there. With the big gate where putting up two rocks, a wonderful garden tree, stepping stones to take a walk through a garden and well, I think that a magnificent Japanese house was built on the extensive site in this home. I think of feeling regret and chagrin of people who lived. It is a natural disaster and a man-made disaster not to understand when we meet. I walked through the disaster spot and thought that it was that living together on a day thing was mysterious today and was happy in this way. A chief character keeping our “life” and “living” is ours. I refreshed a feeling without leaving everything to others when we were always conscious as much as possible and must follow our “life” and “living”. 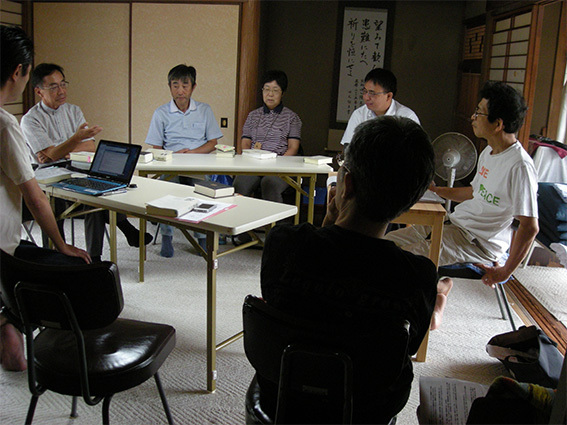 I was in charge of the third sub-meeting for JMF seminar which was “the mission of the prophet and the social responsibility in the modern society as the salt of the earth” by a JMF seminar holding with Honan-cho church as a meeting place of Suginami-ku, Tokyo in this October, 2014. It is the report as follows. I wanted to do it at an opportunity to think how can we recognize it and what kind of thing can we do in the world where we live with Anabaptist-Mennonite related brothers and sisters of each place of the whole country in this seminar. Therefore at first I carried out the questionnaire for the answer for three points of next questions. And I made a collection of answer documents with the cooperation of 13 Mennonites of each place in Japan. １．As for Jesus Christ, how did he catch the problems of the place where he lived, and how was it worked on them? What do you think of it? 2．As for you, what kind of today’s world problems should a church or a Christian work on being encouraged, and being promoted by a vigor state of Jesus Christ now? In addition, what reason to think so about? 3．How do you really work on those problems? Or are you going to wrestle? Or what kind of action do you think it to be possible? 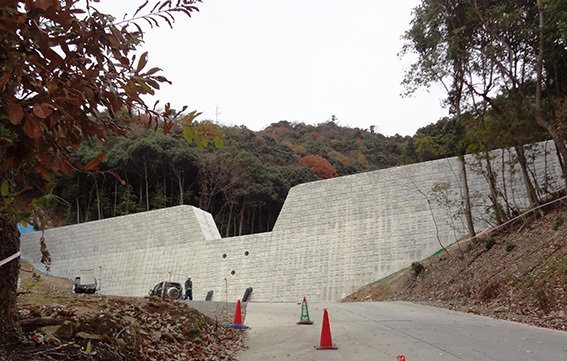 As for the breakdown of 13 people who cooperated were two of Hokkaido area (JMCCC), one of Tokyo area (TAFMC), two of Tokyo and Yamaguchi areas (BIC), and four of Kyushu and west Japan areas (JMCCC). 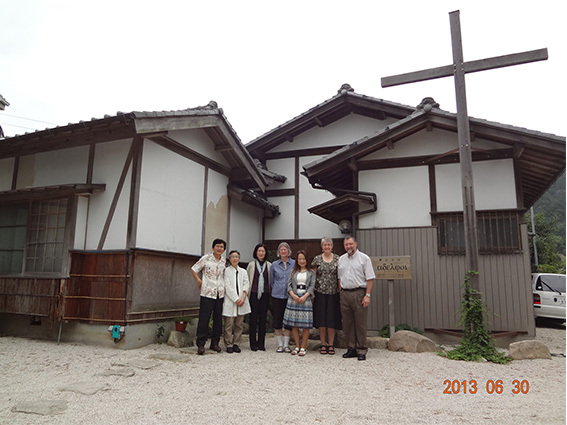 I was fortunate that it was able to get the cooperation of the brothers and sisters of four groups which constituted Japan Mennonite Fellowship or JMF. The answer was thirteen thinking of 13 people. I felt like these things reading their answers. ……Each of them has each life their background and they meet Jesus Christ in that, and they walk their religious life with leading of Jesus Christ. ……. They think about what Jesus did make his appeal for the people in Palestine, and the meaning of his death, and also their understanding of God’s message revealing in the Jesus’ cross and his resurrection in thirteen thinking in 13 people surely. This is why I felt that they became the awareness of their prophetic mission and social responsibility. 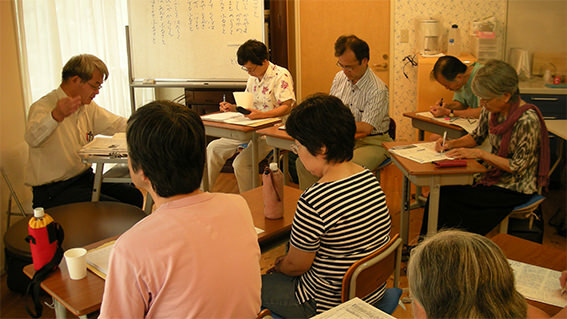 Based on the answers to this questionnaire, we did the purpose of our sub-meeting of this seminar such as our prophetic work and social responsibility that we could carry out where we lived in the Japanese society. And we changed our opinions each other, shared our thought, and accepted other thought of participant so that there was the work that we became the salt of the earth and the light of the earth more and more. We have a common wish to be a disciple of Jesus. Therefore we should hear a thought and the action of brothers and sisters in Christ and we should open our heart and mind ourselves. My wish is that participant wind and deepen more each other and action through the experience of this seminar. 20 people participated in third sub-meeting. We shared 20 people to three groups and had the time for talks. Because we thought that we wanted to do talks along the theme while doing interchange closely as possible. We explained the two sub-themes along the main theme in the first session and report of the Honan-cho church where the food support active for the homeless people, and self-introduction of participant each person. We divided into three groups by the next session and we talked about an impression of sub-theme, and the thought on the main theme, and one’s action at the church to belong to. And then we made a group presentation on the all member meeting in the seminar again. We shared our thinking and learning from the seminar as the each person’s summarize in the last session next day. At first it is the remark of the participant, but following abstract, please consent to be just one of the remarks. Jesus walks it up to the death of the cross as a friend of people such as the side of discrimination, the side of regarding as heresy, the side of abnormal, and the side of being inferior other people. And the vigor state of this Jesus is God itself. God is always faced with a blessing for a human being. And it was shown to God in my action of working place. I believe this and take ground. I live in a place of the everyday life carefully to realize shown from God in the relation with the person to meet. And it is “hate speech” against Koreans residing in Japan what I am anxious and watch closely as one of the problems concreate now. It is an act to threaten a right of life as a human being. And the right that anyone lives freely in peace is an each person’s right supported by a God’s grace. And it may be what you should recognize mutually and guarantee each other as human beings. We are demanded being joint the foreigner who receives suppression residing in Japan in this country. ※”Hate speech” is outside the law, speech that attacks a person or group on the basis of attributes such as gender, ethnic, origin, religion, race, disability, or sexual orientation. We are anxious about the politics and the social situation using of violence and contempt of fundamental human rights occurring because of a human sin now. And we talk it with each other in the church, and we are active in cooperation with lawyers and the citizen in the Oita city. And I protect a policy of the current administration of Japanese government. One day some homeless people came over to the Honancho church for support. We continue the food support to homeless people at our church at a chance. We associate with them while praying. Meanwhile, the interchange with them is born, and there are some that attend at the worship of the church among them. O-San, he talked about the way of food-supporting every month concretely, the way of food-purchasing, and the cost, too. ・The Japanese Government showed a careful posture for the overseas deployment of Self-Defense Forces until now. However, the current administration expresses active support of the overseas deployment of army, and therefore the government hurries the establishment of the necessary laws. I have a sense of impending crisis for these Government policies very much. Therefore I give one’s opinion for a voice and come to think that it is necessary to do a protest movement. ・Honancho church responds to the homeless persons who come over for food support now. I consider this to be a church being connected to the community that continues with a church being done as concrete form. I feel that the Honancho church gives the voice of the prophet to value all lives and dignity. In addition, each one is the different human being who hold inherent background each even if it any person. I am so too. I think that action itself in response to need of the homeless “one” is connected in meeting a characteristic the originality of the neighbor carefully. This is because all people are inherent existence and have the inherent need. Is this not work of the salt of the earth or the prophet inside in the today’s Japanese society where an individual is look down upon? ・How does God look at the human being? A human being is person that it is originally lacking in love and is weak. However, God guarantees human freedom and he invites to expect us to live for the effect of God. A wish of God is that we value our life and living each other. I think that he prays us that he wants you to work together so that this is realized to all people. To that end, at first it is that we Christian value a life and the living of neighbor with the relation. In addition to, we grow for such a posture and we continue practicing it. And then I think that such a thought gradually becomes our social atmosphere and moral culture. ・I want to make such a church to recognize each member’s personality and inherent, to speak freely, and to be able to exist lively consider it in all by God’s forgiveness and blessing, and also Jesus’ model and grace. If there is our this action, we can demand it from society and all world people when the same thing realize it. Therefore I think that there are the work of the prophet and work as the salt of the earth. It became the learning to feel to be strong when they wish that it wants to be a person acting as a disciple of Jesus through the relations with the one about at the place where each lives one’s life. I posed the following questions in the questionnaire and in the discussion of the sub-meeting. I wanted to know what kind of social situations or problems pouring their interest and having a sense of impending crisis of the present. And also I wanted to know how they acted for them. As a result, in both the questionnaire answer and the sub-meeting discussion, even members of church of the same Mennonite group were individually quite differently. I thought that we were a person inherent originally while being surprised at this result simply because it was it. Without excluding this, in addition, I share and sympathize next with everybody, and I want to match an action with prayer. Our origin is that Jesus looks at the each human being as important existence with God. Therefore we are to share this message in a church, home, and the relations with the familiar people. The prophetic work is its deployment. God has already worked to value a life and the living of the person made small in this society. It is substantial in this history that we are involved in a ridiculous war and played role of perpetrator side and also became a taste fitting person in tragedy while we have been preoccupied with the thing of the church and a place of the own life. However we should learn this as an immediate important thing for a history. If we have worry about current politics and the social situation even slightly, let’s hurry wide those actions by ourselves. Japanese Government develops a posture to solve an international dispute with military power now. Are the activity as our prophetic action and a social responsibility not to ban a posture of such government? I think that our social responsibility can mean the following things. For example, it is the present situation to ignore the structure that the current politics produces the needy and violence in our country and the world forever. We share the thought “No” for such present conditions and we give a voice and protect it. And we much change it so that a life and the living of all people are kept. We cannot change the past history, but we can make a coming history now. I demand and call to the Japanese current administration as follows; trying for talks and cooperation not the military reinforcement, lowering poverty and discrimination in between the nation, and strongly pushing forward information disclosure to realize people’s right to know. It was for me at the opportunity when learning thought about a direction of my action in the future and a pillar of concrete practice of this third sub-meeting. I thanked for cooperation and participation of all of Mennonites of the whole country heartily and did it with a report. Thank you very much. That’s all. The dignity of people was the situation stamped on in the times when Jesus lived so that “a stone began to cry”. Therefore the people who gathered around Jesus put up a shout of joy and welcomed him when Jesus entered the Jerusalem. It was right their daring action. Against this, what kind of situation are our here in Japan now? I recognize that t is the situation that we must do something about which were similar situation in the times of the Jesus that “a stone begins to appeal” for. We should cry in this time giving our voices. I want to talk about the times when Jesus was living. As for it, Judaism, law, and the shrine system were absolutized, and the people of establishmentarians sat in the higher rank, and human order was the times when becoming it advanced. And the people of the far – off existence were made light of by people who it was absolutized and were hallowed. And it was the situation that this structure was produced consistently. The full-fledged Jews though about the people who differed from their race and religion as follows: “the sick person lives with sin”, “the child lives with immaturity”, and “a Greek and the Roman live with as a pagan”. They placed such people outside their social bottom or social frame and thought that it was not their neighbor. I think that such an atmosphere was the heavy situation. They showed their interest in an external thing without thinking about the inside of the living hard that judged it whether it was their neighbor. It was a proper atmosphere for people then. However, Jesus said that God did not expect human such situation. Rather Jesus wanted to show whether it was joy of God that a human being “lives”. Jesus challenged changing the human pains and situation. I think it is wrong to conclude that human being who is not minded by God exists. Rather Jesus told that it was a wish of God that such people lived with joy and told by an action. The talking and the action of Jesus were unique. He never used force and the violence. He always served as “a servant” and respected people’s “living” and their personality for deference of people to meet. The people who met Jesus was accepted the freedom to come close in Jesus and the freedom to leave him. Such Jesus’ words and the action as a result would criticized the people who used military power and political power with building religious order and maintaining social status and vested rights keenly. People who were able to make power and profit came to have hostility towards Jesus. Because Jesus took good care of “people of the ground or poverty” who became a target of their exploitation and was killed because it was nonviolence and confronted men of power. Without respecting the dignity of the human life and, as for the people maintaining power, they continue reproducing rank and gap-widening society. They appeal to violence means to maintain their social structure. Such a thing is the way of the world. Jesus worked without depending on power to change such a social structure. However, he was defeated by people who depended on power necessarily. The human being surely has freedom. There is the freedom that does not respect all human lives, and there is the freedom to kill Jesus too. However, the freedom, I am taught through Jesus, valuing that oneself lives and with freedom hopes using it to value a neighbor’s lives actually. By the way, how will use this freedom now? Is it our reality that resemble the situation of Jesus that use freedom for pursue of one’s happiness, power and the wealth? I wait for a question how is Jesus worked here in Japan now. “Beyond the human limitation and exploiting the human being who is nature and a neighbor, and giving priority to realize one’s greed and profit, that causes various human contempt and human rights violations. “ These are words of Tetsu Nakamura of the Peshawar-Kai . I pay attention to “an individual” including freedom. I think that the individualism has “true individualism” and “selfish individualism”. The true individualism is taking good care of oneself and taking good care of the person of the circumstance. In addition, it is to demand that the person of the circumstance is taken good care of and oneself is taken good care of the circumstance too. This produces harmonious coexistence and communities of people. However, does the individualism not fall into “selfish individualism” including myself practically? Will we really take good care of the human being of the circumference to take good care of oneself? Therefore it is to restrain it in response to perceptiveness in our “selfish individualism” to have us. With that mind, we are to point it out and change it if we find such an act in society. For example, I think that the following things are caused because “selfish individualism” spreads in Japan. ・Imperfection of the application of the child victim support method” in the Fukushima nuclear plant accident. ・Leaving of no-regular employee, and leaving of poverty and the gap-widening society. ・Discrimination against foreigner who does not have Japanese nationality. ・Disregard of written petition from the local government of Okinawa to the central government. 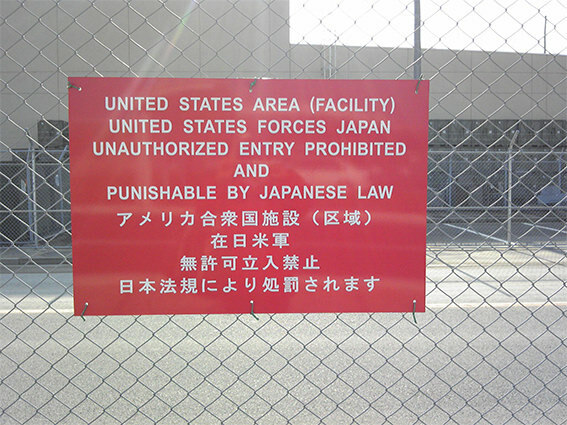 ・Imposition of the US base policy by the carrot and stick of the Japanese Government. I think that I myself can do it for an action from such situation of Japan as follows. The unique people with each need and interest gather in a church. And we must not force our claim on our group with absolutizing our claim. It also must not be concluded such a thing. And we recognize each other’s opinions and actions. We do not spare an effort to find cooperating with each other on the basis of this situation. I keep the following things in mind on the basis of this. My worship sermon until March 11, 2011 was thoughtlessness not to consider that politics might make light of the life and the living of the nation. I thought that I could not contribute to keeping their life and the living for members of church and people of the circumference under such circumstance. The important information on avoiding the radiation exposure by Fukushima-Daiichi nuclear plant accident was because there was a fact covered over inhabitants by the government. And the people of the affected area cannot but live in areas more than annual space radiation dose 1mSv more than three years. In this way, the Japanese government continues the politics to induce seem to endure even if they suffer a disadvantage and a nuisance the people who living in the affected areas. I talk about importance of having the consciousness that a citizen keeps a life and the living by oneself, and the importance of having the interest in movement of the politics, and when it is necessary, we give a voice and go out to the streets, on the basis of the reality of the policy that down play a civic life and the living by the central government or the local government on my worship sermon after March 11, 2011. Current political administration or a man of power uses the word to carry out the principle of active peace or to keep a life and the living of the nation. They as the believer of the power are going to realize harmony by military power. Even if the words to use are the same, we demand peace to use neither the military power nor the violence for. And we should declare it towards the outside. In addition, it should be a message shown from Jesus Christ when we tell that we keep our life and the living. There is a proverb called “Inochi-Tendeko” among Northeastern people in Japan. This means that they keep their lives and the livings in each other. I want to make an opportunity to share thought to make the society which we can follow with each other. Therefore the members of church of us share responsibility participating in the public political through election and we think that we can send our claim and opinions to the people of the circumference by various methods. “The true individualism” deepens in love to love oneself and a neighbor and anyone produce society or the communities which can realize happiness. At first, it is important to deepen bring up, to share, to open the “true individualism” in a church or our neighboring place. a. I think that I want people not to be able to meet directly to hear my message and send my thought through a homepage. It was only a homepage of JMF first, but I use my Facebook from 2013, and also I use the homepage of our church from 2014. This is because I want to tell my opinion and claim and also to interest in the government including election to many people through these websites. b. I continue still learning why “Hiroshima (an atom bomb having been dropped)” happened. Do not let cause the use of the third nuclear weapon; I work on the succession of A-bomb victims’ testimony to save it. They are the following things to have understood by an action conventional me. We Japanese were given sovereignty rests with the people to a citizen in a constitution after the defeat. It is necessary for us to use this sovereignty rests with the people carefully. It is because it is very important because “a good citizen” is brought up. And these “good citizens” show interest in testimony and the message of the A-bomb victim and adding they come to be interested in politics. Because people are interested in politics, I want to work on the testimony activity of A-bomb victims becoming “seed”. A large quantity of busters with a radiation which can kill a human being are made and held in this world. I accuse the weapon of these quasi-human ways and intend to participate in movement to become extinct. c. In the case of using of the words of nation or public, for example, there are national interests, national government, public interests and so on. It is necessary to examine it closely well whether the government really takes good care of the people first. d. I object the Special Secrecy Law, the nuclear power generation re-operation method and a constitutional amendment. In the current Japanese society situation; if it is Jesus, what he stares at or how he will worked. I wrote this essay to mind in Jesus Christ. It is big encouragement for me that there are persons reading. Thank you very much. I would like to report about cooperating with the JUNOD in 2013. And I would appreciate continue to cooperate with JUNOD, the people who spoil health by Fukushima nuclear plant accident radiation exposure, by the specialist in Hiroshima. I was able to be present at their consultation, to participate in meeting with the physician visitor and the JUNOD, and to send the supplies for the effective to give radiation material outside body such as Japanese apricot, miso or soybean paste, dokudami tea or houttuynia cordata tea, and special bath articles. The people who were exposed to radiation by Fukushima nuclear plant accident evacuated to each place of the whole country independently, but their physical condition became poor. So they came over to Hiroshima in hope the medical examination by the specialist who had been engaged in A-bomb victim treatment many years. The physician visitors were voluntary refuge or people emigrated to Hiroshima, Okayama, Takamatsu and Kagoshima from Fukushima, Tokyo, Yokohama and Chiba. A total of 26 people including the children consulted from a specialist eight times at a clinic of Hiroshima. The symptom that they appeared for were a nosebleed, diarrhea, the pain of the throat, weariness, forgetfulness, sleeplessness, a heartache, easiness of fatigue, defects of memory, dejection and thyroidal relations. The doctor checked the health condition of the patient and did inspection to check radiological influence entering the body of the person. And he gave the medical application to the symptom of the person for a patient and did advice to overall everyday life to the person. The expenditure of this year from JMF was 32,056 Yen for the tea and cakes charge of the meeting and supplies purchase charge including postage. It is expected that hope of the consultation increases from Fukushima residents and immigrants of each place of the whole country to consist of nuclear plant accidents in the fourth year in 2014. 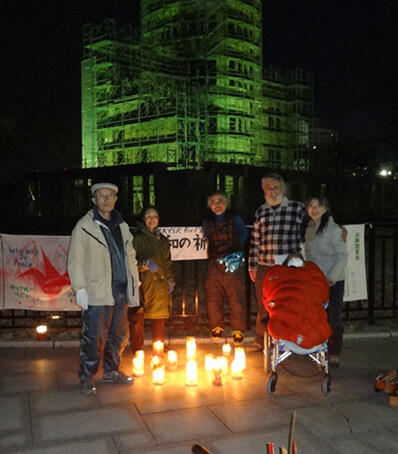 I want to continue cooperation to the Fukushima nuclear plant accident’s radiation –exposed victims’ assistance by the JUNOD as activity of Japan Mennonite Fellowship (JMF). I am happy if you can support this activity with interest with your continue assistance very much. Thank you very much for your cooperation. For all that, for those three years, forced refugees, voluntary refugees, and people who engage in accident convergence are forced to sever life by Fukushima nuclear plant accident. I think in this way, Japanese government makes light of the life and the living of inhabitants in Fukushima here. For example, it is about the criterion of the space radiation dose when the children evacuate. The government decided that 1mSv a year or more must not let them expose to radiation therapeutically before the nuclear plant accident. However, the government judged that health did not have the influence to 20mSv a year after the radiation exposure of people promptly. It is said that the people can return home to 20mSv because they are safe, and as a result, the compensation to the people who do not return will disappear now. I am afraid in what “the security myth” that it is convenient for the government spreads and is forced. The area that 1mSv exceeds are left, and many children and citizens live in there now. Will this be a abandoned people policy by government? I think that it is natural to have had independence refuge from the people who felt it when this is not made knowing the price of being a debtor. What is the thing which we should protect? The nuclear power generation makes ends meet with structure of the discrimination. They are built by remote regions, and it is said that they do not make it because the populous place is dangerous. Contempt of the human life is seen in the workplace of people working by nuclear power generation. For example, security is secured, and the employee of the electric power company works, on the other hand, it is a general worker to work at a dangerous place. The general worker is rated by the rating of a company undertaking an original contractor, a primary subcontractor, the second subcontractor of work, and so on. The last worker of these rating is people of daily employment. The wage or the security comes to have light by these orders in this way too. It is nuclear power generation that the discrimination of a human life and the living become natural. On earth till when do we continue this? In addition, the wastes which cannot process safely continue collecting. Is this a crime to the next generation? While I learn nuclear power generation, and I want to continue the work inviting people who have healthy uneasiness coming to Hiroshima. I want to continue my activity while it is supported by people connected to Japan Mennonite Fellowship (JMF).Again, I want to ask to have you pouring interest and supporting continuously. Hiroshima Report No.12 “My work is to express A-bomb survivors’ heart and mind”. It began the year of 2014. Could you readers begin your new age well? I pray for this year when you receive a blessing of God every day and walking in good health. It is conveying about A-bomb survivors having talked to children and adults in my work. When we citizen continue step to sow a seed of the peace not war, I think that the message of the A-bomb survivor gives us a suggestion that encourages our “motives” and “the direction to walk”. I introduce one of the manuscripts which I prepared for children in this “the Wind from Hiroshima”. I am very glad that your children read it too. A-bomb survivor expressed the A-bomb sound like “Pika, Don”. This is the A-bomb which eyes and ears of the A-bomb victims caught at 8:15 a.m. on August 6, 1945. 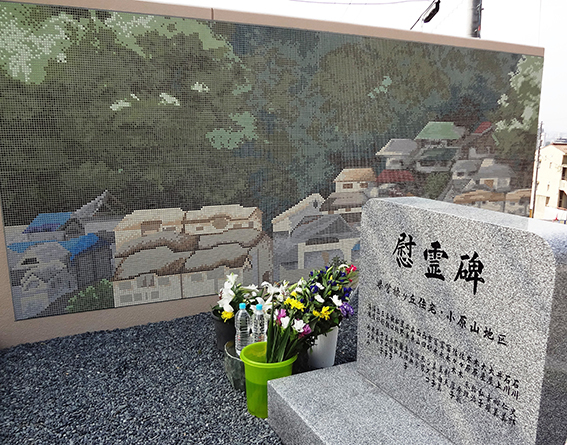 I want to convey what I heard from the A-bomb victims who experienced the atomic bomb. I want to tell you through thinking about two “why” with you everybody. At first, it is the first “why”. An atomic bomb would be dropped by Hiroshima and Nagasaki who were why. It was because it made war on between Japan and the United States. The atomic bomb was not dropped when it did not fight. Let’s look back about the war. At first the cause dropped an atomic bomb to Hiroshima and Nagasaki was on war between Japan and China. Many Asian countries became the colony at that time by the Great Powers such as the United States, the U.K, Spain and the Netherlands. They were made to make an unequal promise or treaty and lost their precious resources, land, work force and came to be made to buy industrial products instead. Small islands Japan demanded resources to make the strength of a nation strong. Therefore Japan dispatched the armed forces at first to make the northeastern part of the China the colony and invaded it and occupied the area. It was 14 years before the atomic bomb throwing down by the United States. The Japanese military caused a fight called the Manchurian Incident and made a puppet state called as Manchuria in Northeast China and Inner Mongolia. Manchukuo was made as if letting many farmers emigrate from Japan and taking Chinese land away. However, the Chinese did not remain silent, too. They resisted occupation in China intensely. And it was eight years before the atomic bomb throwing down, Japanese military at last the all-out war state against China. The United States and the U.K. objected to occupied territory expansion in China by Japan to follow their rights and interests. Therefore they worked as a Chinese friend and have begun to defeat Japan using various means. Japan got hard at points such as the trade to import oil and decided that it fought against the United States at last to protect self-interest somehow. The Japanese military did a surprise attack to U.S. forces vessels of Hawaiian Pearl Harbor on December 8, 1941. This was four years before the atom bomb throwing down. Japan began war in this way with not only China but also the United States. Japan made Asian countries the battlefield and was the one which continued fighting with China, the United States and the U.K. And the United States used atomic bombs for Hiroshima and Nagasaki. I do it “why” the second “why” conveys the atomic bomb experience that it is hard even that the A-bomb victims remember it. The first reason is because is only the A-bomb victims who survived it all over the world in Hiroshima and Nagasaki as for the human being who can talk about the direct experiences when can atomic bomb exploded on a human head. The A-bomb victim wants to tell everybody when an atomic bomb exploded, at first a radiation was emitted, and it shone the sound of “Pika” with an atomic bomb, and the light having been the heat rays that had the terribly high temperature that could kill a human being. The human body bathes in radiation by the explosion of the atomic bomb and a cell preparing the body into is broken and results in depth before long. In addition, burning itself by a high temperature was not only the surface of the skin of the body but also the inside of the body and die. It is not only these things that I want to tell you. It was “strong and strong wind” with a sound called “Do-n” of the explosion of the atomic bomb namely a shock wave. The shock wave was the neighborhood of center of an explosion, and the speed to advance for one second is 440 meters. And it went ahead 60 meters from the center of an explosion at two kilometers. Fire occurred by this “strong wind” from the center of an explosion, and the city of Hiroshima had become the big fire. And the people who were crushed under broken buildings, and were not able to move were baked with living without being able to succeed in escaping and have died. The A-bomb victims want to tell you about their experiences with “the radiation”, “heat rays” and “the bomb blast” by this atomic bomb. The second reason is what A-bomb victims understood through their experiences of war and atomic bomb victim. It is very important that we must to act aloud against war and nuclear weapons. We must create the peace by oneself, and we must keep the peace by oneself. I want to tell you that the important of the effort that we always prepare the world where has neither the war nor the nuclear weapons. When an atomic bomb was dropped, please hear the experiences of Hiroko Izue’s “Pika” and “Don” story which was a girl student. “Children were no more than study in those days. By an order of the Japanese Government which was going to continue fighting, various work was assigned to both an adult and the child, and we girl students did the work such as munitions factories, other factories and business factories. And we were made to work the building evacuation too. Building evacuation is to break many houses because a fire prevents an expanse and the whole city from burning by air raid, and to make wide road and vacant land of the width. And we did those traces putting in order”. It was very fine in Hiroshima on Sunday, August 6th. Izue-San was 13 years old and her sister was 12 years old. They both of them went outside for working. Izue-San went to the Aki printing company of the student mobilization, where it was 2.4 kilometers from the center of an atomic bomb explosion. And her sister went to Zakoba town for the building evacuation work. At 8:15 a.m., Izue-San in a morning gathering was the vacant land where it became behind a building, and students took in line properly. Right then, a flash of light “Pika” was strong, orange light seemed to become until the end of neighborhood. Izue-San was lucky without burning itself and without receiving direct heat rays because her having been 2.4 kilometers away from the center of an explosion and her leading teacher avoided sunlight and led students behind a building and had a morning gathering. What would happen when they took heat rays directly? Heat rays of 2000 degrees arrived at 600 meters from the blast center, and it is said that a person who bathed in heat rays at 1200 meters from the blast center burnt itself to the inside of the skin. What would happen to the body of Izue-San if these hot heat rays hit at any moment though. Of course it was a major burn. 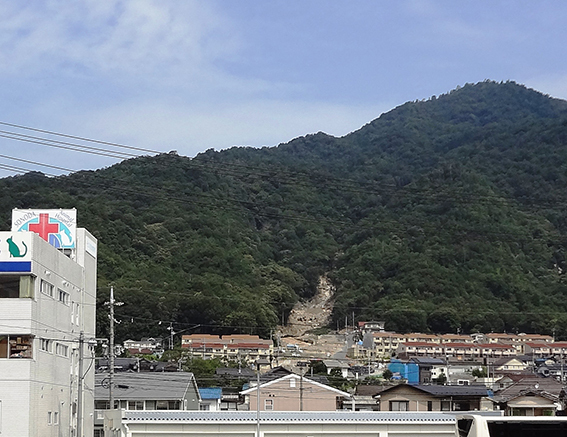 Izue-San was lucky, but her twelve-year-old sister was working with a building evacuation of the outdoors in Zakoba town near the center of an explosion. There were no things to block from “Pika” of radiation and heat rays, and also “Don” of the bomb blast there. It is said that the speed of the bomb blast was 160m/s at 1 kilometer from the blast center. This is four times of the typhoon. Naturally the human body will be dispelled. What has happened to the body of Izue-San’s sister? We do not know yet what kind of her state, and where did she die? We Japanese people must understand and recognize with people of other countries each other, and we must become able to solve a fight or a conflict by talks. We must grow up certain persons what we should get along well with people of other countries including children. Finally it is the message from the A-bomb victims to you. Then I want to end the talk that I heard from A-bomb victims in this. 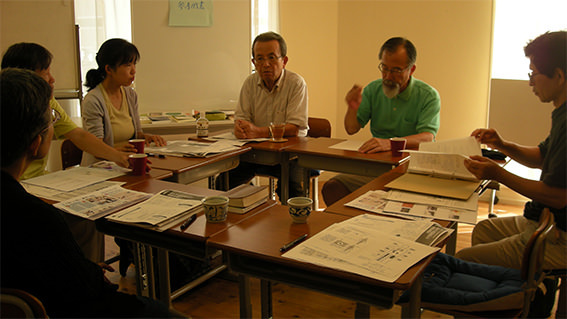 We held the 7th Seminar for gathering ‘Mennonite’ and ‘Hiroshima’ in the chapel, Aderphoi, of Hiroshima Mennonite Church on September 14~15, 2014. The theme was ‘we keep our life and living’ ……that is practice of prophesying it in the political movement to down play a life. I want to report that what kind of things were shared by a seminar. 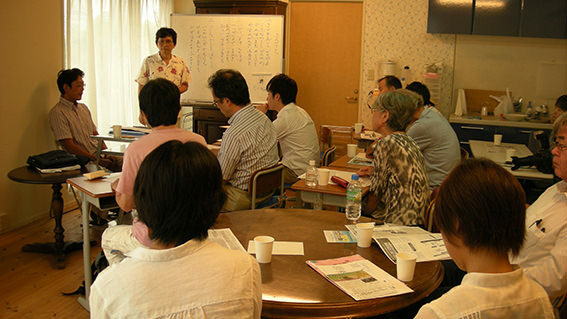 The participant was 12 people and one from Honancho church of Tokyo Area Federation of Mennonite Churches, one from Takibe church of Japan Brethren in Christ, one from Kirishima Brethren church of Japan Mennonite Church Conference, one from Miyazaki church, six from Hiroshima church and two from non -church members. At first to share at the place of our life and we exchanged opinions with each other about viewpoint of the action to value a life and movement to down play a life freely. There were the following opinions. About the political developments that our life is down played. ・The measure for the victims of Japanese government and Tokyo electric power company about the Fukushima nuclear plant accident. ・The wage of Japanese worker is low. ・A heavy load had us carry is had only us carry. A certain government and company are not going to achieve responsibility near doing damage to. Structure not to change since so-called Yanaka-Mura mineral pollution case, and a Minamata disease case continue to date. About an action to value our life. ・We fully realize that we belong to our church community. ・The youth with the church member chooses an occupation now. And we want to learn it with him through the choice of his occupation. As for us, taste fit participant from each place for the joy that can interchange through this seminar. ・I think that it is not to reform the other person to preach the “Words of God”. It will be able to answer in the affirmative that we live with the other person together. And our action itself is preaching the Words of God to the people in the world. Our act captures the heart of world people across our faith. ・We deepen the fact of the community and the fact of the faith community. We want to realize a God’s Kingdom as a man of business in our workplace, and our do-worker affirms oneself and we want him/her to make God’s Kingdom with the power. ・We want to leave the record of the persons of faith in the countryside. And our existence itself is important. I conduct the funeral service approximately two times a year now. Therefore I want to increase parts interchanging with these people during their life time and share. ・We want to make use of each gift in the connection with the people at both the home and the church. ・They had joint ownership and practice of “Inochi Tendenko” in a certain town of Tohoku district, eastern Japan on March 11, 2011. We want to learn about “Inochi Tendenko”, which means ‘keep one’s life by oneself’ as a disaster prevention term in the area of Tohoku. ・We bring up a spiritual thing in a church. ・We became quiet together and have something growing up in praying together. And we recognized it. ・The words of sermon become through the sharing of ‘sermon preparation meeting’ and ‘Bible study’. ・I think that we should wrestle as a thing of the whole member of church without a church handling the problem that the member of church has as a personal thing. For example, making a work place of the employment of the youth or making the cohabitation home of the elderly person or making the place of the encounter for marriage of the youths. The talks of the participants advanced based on these opinions and were collected in the following contents. We expect that next realizes it in the relations with the people of the circumference, a family, a church, a community, a country, a country and the other country. ・One individual is admitted his or her existing by the person of the circumference. ・One individual is required from the person of the circumference. ・There is not the nonsense individual in anyone existing. When the seminar that became the seventh was over, it became content to check concerning with “motivation” that why we held a seminar and we learned together for me. As for our wish, an each person’s individual is required and the existence is respected and is that utmost support is received. We expect to a family, a church, a community and the country which these thoughts are shared and are practiced. Therefore I have a big question in for these social movements and incidents. In other words this is because many citizens really become abandoned people that are poor people separated by national protection. I anger in a civic life and living being made light of. Don’t forget Hiroshima and Nagasaki of atom bombs, Okinawa of US military base, Minamata of public pollution, and Fukushima of nuclear plant accident…!! These are persons who cannot realize accepting their existence and cannot make oneself believe that I am required in our circumference and each place of Japan. And it is that we hold a thing create abandoned people inside of oneself to be important. In addition, there is the fact that we are really on the attacker side when there is it. Nevertheless, it is kept alive to us and becomes the member of the church, and we are happy because we are given a wish that it wants to be the salt for all mankind. We want to live from now on to realize “the wish” provided to us in this “forgiveness” even a little. May our wish be God’s Will! I thought about the following things during the preparations for this seminar. As for it, we wanted to discuss the present conditions that the politics of these days make light of life and the living of nation by this seminar and was not going to follow. And we disciple of Jesus and church of Jesus should naturally criticize such an unreasonableness as a foreteller of the world, and at the same time I thought that it became the seminar to share an intention to keep our life and the living by oneself with participants. I think that it is richer, and the result of the seminar was deepened including this. As for me, it became the discussion shown my motivation and object to my asking “why do I become a prophet?” or “how do I want to have it?”. We have two neighbors to the present same generation and a generation born in this country in the future. And we are fellow persons receiving expectation from the weak neighbors of the situation, in particular. We want to realize the wish hearing from the neighbors in the way of our style “here” and “now”. I want to send it to readers in this thought from now on. I took time for reading of this time in “the Yanaka village extinction history” (written by Arahata Kanson, page 180 in the Iwanami Library). It was reading for me to read or take a rest, and I took a rest or read again after all. It had two reasons for me. One is to accuse a figure of the ugly government where it is hard that the contents look straight from the side of Japanese people. Because it was considered as the arsenical poisoning case that took place in Takachiho Toroku, Miyazaki prefecture which I had visited to the second and a case to have structure same as Minamata disease of Minamata city in Kumamoto prefecture. ※Minamata disease, sometimes referred to Chisso Minamata disease, is a neurological syndrome caused by severe mercury poisoning. It was first discovered in 1956. It was caused by the release of methyl mercury in the industrial wastewater from Chisso Corporation’s chemical factory, which continued from 1932 to 1968. The reasons why I call these cases are that there are an assailant and a victim. These cases include a common point. The victims are to be countryside away from capital Tokyo of Japan. And it is to be big companies and government to have tormented the victims who demanded relief for a long time. Furthermore, the process from the suit of inhabitants to a dispute to begin and end is common. The author of “the history of Yanaka village extinction” accused a process of their slackness with the central government, a local government and a copper management company that they concealed Ashio Copper Mine pollution incident, and formed Ashio Copper Mine Mura and oppressed the inhabitants and abandoned people by inaction or artificially confronting Tanaka Shozo which snuggled up to the villagers who had been deprived of a place of the life by Ashio copper mine mineral pollution case till the last. ※Ashio Copper Mine pollution incident was the pollution case of the Ashio Copper Mine which rose around the Watarase river of Tochigi prefecture and the Gunma prefecture from the 19th century. And the toxic substances such as smoke, mineral pollution gas, and mineral pollution water brought remarkable influence by the development of the mine in neighboring environment, and dead persons appeared, and damaged spread through cultivation things and the fields. ※Tanaka Shozo (1841 ~ 1913) was a Japanese politician and social activist. He is considered a hero for his actions revolving around the Ashio Mine Pollution incident. Starting from the mid- 1880s, the mine became highly polluted and in 1890 a large flood carried poisons from the mine to surrounding areas. Tanaka took his cause to the National Diet but his efforts met with little success. ※Mura means non-uniformity or surface irregularity. It is ridicule or a term to call with criticism a special social group comprised by the authorized person concerned of a big company, a government, and a university conclude by a right over the mine development and a relationship. In March, 1906, the Tochigi prefecture authorities decided Yanaka village for forced abolishment of a village by mergence. In January, 1907, the Japanese government announced the application of the Land expropriation Act in the Yanaka village. On July21, 1908, the government did whole Yanaka village in the river area. And the government constructed a large reservoir by a law and has sunk Yanaka village in water after all. 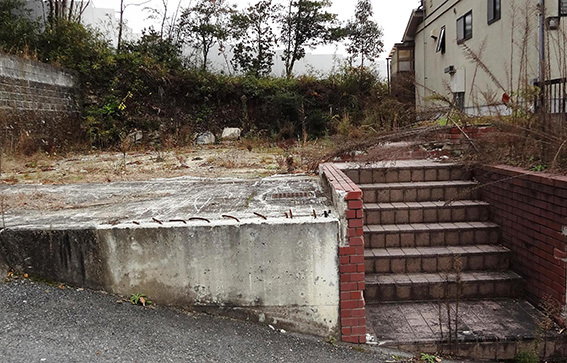 It is the biggest common point that the Japanese government and large enterprises downplayed a life and the living of inhabitants of Yanaka village, Minamata, and Toroku. I feel there is a message being performed now and about the future in “history of Yanaka village extinction”. A basic guidance of “the living support law for children and the victims of a nuclear plant accident” that we waited impatiently for on August 30, 2013 was shown from the revival agency. The details look at “What’s New August 30 of the revival agency homepage”. As for this support law, the person targeted for support at first (June, 2012) was to select a radiation dose as a standard regardless for a residence district. However, “the support area for” is limited to 33 cities, towns, and villagers close to around Fukushima nuclear power generation is accord with next conditions for the plan that a revival agency showed on august 30, 2013. The conditions as follows: the one is the area that might reach annual multiplication dose of radioactivity 20SV. The second is 20SV is less while continuing, but is the area with appropriate dose of radioactivity near the Fukushima Daiichi nuclear power generation. It is a custom that the thing needing support in the inhabitants except these areas establishes “an associate support area for” every support measure as “a person to follow” and supports it. And the contents of important aid package are like general rules, and the concrete mark is not shown. It is necessary to listen to the voices of the victims well, and to do it concretely to really meet the need of the victims. I think that there are big problems in “the support area for” provided for this plan of the government. Living in the whole country as well as the local inhabitants of these 33 municipalities while being afraid of much radiation exposure in and outside of the Fukushima prefecture, or evacuate, or emigrate now. The reason is because the place where they live in is beyond space radiation exposure dose of radioactivity 1mSV in the permission level year before the nuclear plant accident. Or even less than 1mSV are because a child and adult really showed poor physical condition. Furthermore, they feel ganger for radiological release not to know when it ends. There are people to live in a high radiation dose for Fukushima nuclear plant accident than before. In addition, there are people who changed the workplace, a school, and the place of the life under the influence of a radiation does. And the people needing support in this way do not limited to 33 municipalities. It is people called so-called people targeted for associate support that I bring into question. However, to our regret, it costs this how a revival agency decides an associate support area for. I worry about them heartily. I participate in the function of “the Junod” supporting their health of Fukushima nuclear plant accident’s victims, and for an immigrant evacuating to Kyoto, Okayama, Hiroshima, and Okinawa from each Kanto prefecture which I could know, do not become targeted for support in the revival agency plan. May they receive the support that they need when they are performed “family handling targeted for associate support” of? The people who should be relieved with the idea of “the child, victim’s support law by the nuclear plant accident” by “the basic policy plan of revival agency” which government decided in June, 2012 may become “the non-victim”. Because there are people who have a disease due to radiation exposure develops in the atom bomb radiation exposure of Hiroshima and is authorized as “an A-bomb victim2, and receives the publication of “the A-bomb victim health record book”. On the other hand, there are people who are not authorized as “a no-A bomb victim” while being caused by atom bomb radiation exposure obviously. The government minimizes a person target for support, and I think that the responsibility that they bear is going to lower it. The inhabitants of Yanaka village, Minamata, and Toroku were look down upon their lives and living by the government and large corporation. We must watch a trend of the government so that such a thing does not happen to victims for Fukushima nuclear accident again. We in particular must watch the change of “the children and victims’ support law by the nuclear plant accident” carefully. We want to come true in the way of us style which the wish that we learned from our generation and the next generation, “now” and “here”, especially from a neighbor having weak situation. I want to send it to readers in this thought from now on. Thank you very much for reading. 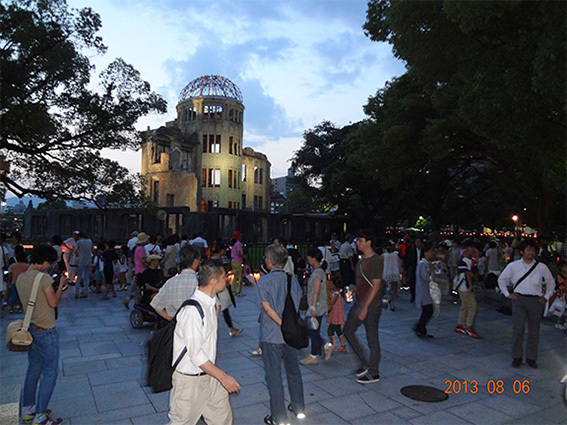 People are gathering in front of the A-Bomb Dome in Hiroshima in the evening of August 6, 2013. It is the beginning of July, and here in Hiroshima is days of high temperature and humidity like the rainy season. How about your places? It is also the time of the school trip during the spring and summer. 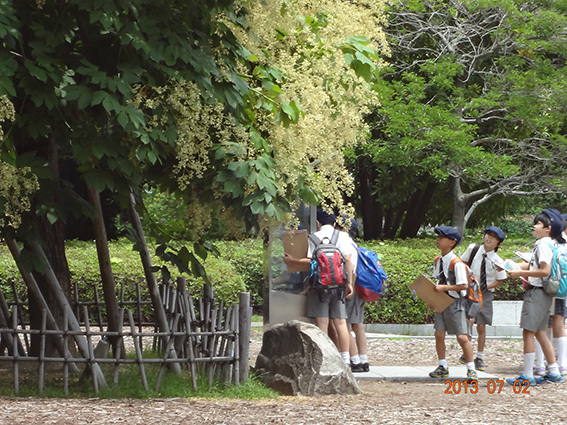 Many primary and secondary students visit the Peace Park the day after the day from the whole country Japan. And there are many travelers from foreign countries too. Most visitors come over to learn the history of Hiroshima. I am encouraged in their challenge spirit. Well we had our worship with Christians from North America in June. This time I want to introduce my message or sermon of the time to you. I want to tell you about the three kinds of sharing with living both America and Japan that wanting been the disciple of Jesus. I preach this theme at the Hiroshima Mennonite church for a long time. I strongly sympathize with the words that Simone Weil. “Distinguish whether the heart of a certain person went through the fire of the love of God does not talk about God, but how talk about earthly things”. ※Simone Weil (1909-1943) was a French philosopher, Christian mystic, and political activist. I think including not only talk about God, but how to wrestle with the earthly things in these words. When it is said why I sympathize with her words, Jesus talked about the earthly things in the Jewish land approximately 2000 years ago, and this is because it clarified the Gospel by wrestling in them. I read a point of the Bible of what Jesus talked about and having wrestling. (Luke 19:1-9) Jesus proclaimed, “This man, also, is a descendant of Abraham” toward Zacchaeus. Let’s lay it mainly on eyes staring at human being that a sinner is saved. Each of us has a peace to be Son of God loved by God and a descendant of Abraham. Son of God loved God is not only us, but persons to live with us at the same period. We follow it in Jesus and talk about “how you are an important person with a look of God” to our neighbor, and we want to support you that the neighbor notices that oneself is an important person and live with pleasure. Not only of the same period after us are a descendent of Abraham and children of God. We, so to speak, have two groups of neighbors which are neighbor of the same period and neighbors of the next time. What do neighbors of the next times expect of us? They will expect us to make the world where bread is shared, and there is not a starving people at all, the nuclear weapons of the United States, Russia, China, and other countries is discarded, and solve a fight by talks, children of the world learn at school in peace, and mature into an adult. Let’s make the end in the sad reality in our times that the dream of children living in a dispute and poverty “becomes an adult”. In both United States and Japan, we have two groups of neighbors and realize “happiness and shalom” of two groups of neighbors, and receive “a vocation” to save neighbors. Secondly, what kind of situation we face. We understand that we think about Jesus. It was “a cross” as a result that Jesus worked on the talk and the problems of the people in front of the people. Why do the people nail other human being to “a cross”? Why is it? I think about realizing the happiness and shalom of the neighbors and an action to serve a neighbor as follows. “We should not control a neighbor by power, and should not solve things by the power. We should stand in the situation of the neighbor and should hear claims of the neighbors well”. We have to be going to come true even if it takes time and even if there is trouble for it. Even if say so we are hated and refused without being understood from that “depend on power and solve things and things to give priority to self-interest over”. The extremity of refusing it is persecution and is oppression and is the death penalty with the cross. Showing a tusk towards Jesus and “the way of life to depend on power and to pursue self-interest “. And they are not losing. They still surround us now. Therefore it faces refusal same as Jesus that we serve two groups of neighbors. And it is a reason not to be realized easily that we wish for it. We are nonresistant and stand in the same ways as Jesus without not depending on power for the use of power, and not letting an opposite people surrender to by power. Even if we use an example, we have no winning chances for an enemy fighting a decisive battle thoroughly. You should lose then. It is necessary for a losing human being. You should lose. A losing human being is necessary. We receive current freedom, happiness, and shalom simply because there is the stratum of the people who continue losing. Nailing Jesus to a cross, and depending on power, besides, and the human world in pursuit of self-interest continues now. Jesus and his disciples are still crucified when I think of it. However, the cross of this Jesus is “the forgiveness” to the people who depend on power and pursue self-interest too. There is another person who pursues self-interest with the help of power in us. Therefore Jesus is still crucified for us too. We crucify Jesus that are forgiven in Jesus. We want to change this human reality to the human valid place appropriate for the forgiveness simply because it is forgiven. We must stop that a person with power entrusts the power and suppresses a person without power. Then we will find oneself on a cross in the same way as Jesus too. We will make the place where we live full of way of life not to depend for even if it can happen. Thirdly, we have “a hope”. People who wrestle so that an each person’s life is protected and daily life is protected come into existence in Japan like as many citizen who wrestle to create peace come into existence in the United States. They appeal for nuclear weapon extinction among “the Hibakusya” or the A-bomb victims and people who raise a voice when nothing can make a good thing with the war come into existence. People continuing the protest activity to what U.S. forces continue staying in for sixty-eight years for the U.S. Government and Japanese Government come into existence. People giving a voice of the nuclear power generation decommissioning come into existence from the people who experienced a nuclear plant accident in Fukushima. They claim that a nuclear peace use is impossible and their living environment is exposed to radioactivity by non-disposal of nuke puke and complains that it stands back to back with danger. In my imminent places, the people who are going to support a spending the night outdoors worker, the life poor, and a foreigner standing alone come into existence one after another. We are convinced, “you and he and she are the children of Abraham, and your life is important for God”. Therefore we talk and wrestle without depending on power. This our way of like itself is one “seed”. Let’s continue this seeding for noon, night and Morning. The seed which, by the way, we sowed which we do not know starts a bud is brought up. Somebody continue sowing the same kind in the place that we do not know and the kind starts a bud and is brought up. And the friends who wish and work that they want to value an each person’s life come into existence. We have a hope. It is that “a person creating a peace and a person with a heart of Jesus” come into existence more than our thought. I may want American Christians to add it to your activity. Please sow a seed for Japan and world in your country. Would you tell their voices to the American people and the U.S. Government to realize the wish of people of Okinawa and the A-bomb victims including Fukushima nuclear plant accident victim. I want you to appeal to the American citizen and the U.S. Government as follows: They are the promotion of the security policy for Marine Crop’s base closedown of Okinawa and nuclear weapon extinction and closedown of the nuclear power plant with the United States leading other countries. We are your friends, so we will have the courage and the help through your activity to create peace and to appeal changing a nuclear and military policy of U.S. Government. These are my wish and requests to you. It takes time so that what we wish for is realized. It is because the grace of God is going to change the human heart to the heart of love without power. In this process, even in both the United States and Japan, we Jesus’ disciples will be still continue being defeated by people who use power to pursue self -profit for a while because we do not depend on power. We have a prospect to already include a cross by all means, and we are for “the action to value the life of all people”. Many guides in Christ talked about earthly things and wrestled. There were steps of their faith and a cross of Christ because of it. Thanks to work of God in there, there are our happiness and shalom of the present days. We want to witness Jesus Christ after the follow of that guide at a place of each life too. Even if we continue being defeated by people of power, and even if they pile up, God surely will use such us. And the generation after us will be able to get happiness and shalom higher than us in a larger community. We will continue an action valuing the life of all people with our friends tenaciously for a long time. We must keep the health of our body long for that purpose. Let’s keep it in mind in taking nourishment and the rest. With what in mind, we will continue learning what our neighbors need. I pray so that God follows the health of the mind and the body of everybody. And I pray that you will have a God’s blessing everybody’s work. I thank for that I share these three thought with everybody and can walk. I did a message by worship under the theme of “the two neighbors of the same period and next generation” until now as wrote. We receive expectation from a neighbor born in this country in the future and live a life among other things. We want to come true in the way of us style “now” and “here” imagining the wish of those neighbors. I want to send it to readers in this thought now on. Thanks a lot for your reading. “From Hiroshima of May – Constitution Essay, after all it is an individual”. There are the days to sweat in these days. How have you been, everybody? It was held “Hiroshima Flower Festival” in Hiroshima during Golden Week or national holidays from May 3-5. 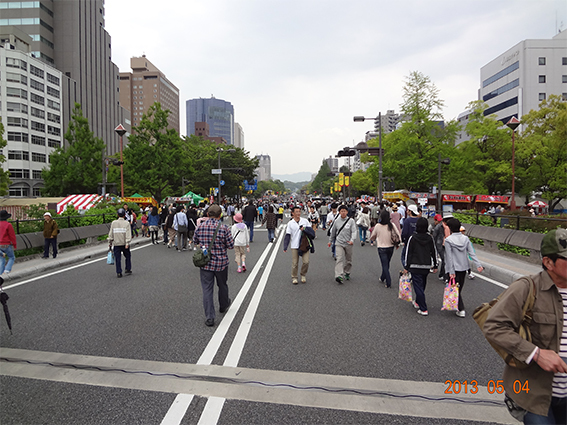 The venue of the festival was Heiwa Odori or Peace Boulevard which lay across the city in the east and west. We call it “100 meters of streets” which is 100 meters wide and runs 3.6 km. The streets became “the vehicle-free promenade or the pedestrian’s paradise”, and various parades were watched and there were the stands each association of people from the same prefecture (Kenjinkai) to provide a food and a special product and the stands of the citizen group and were full very much. I also enjoyed a festival with my family, watching the parades, eating Soki (boneless pork ribs) soba noodle soup in the Okinawa booth, and buying wine and black bread in the tent of a friendship association of Russia. By the way, as for me, there is difference in words worried about in these days. It is difference between “individual” and “person”. Look at an upper photograph. Everybody walks the street freely. Their clothes are various, and the place that they aim at is each. For example, it is possible for way of speaking when we watch a walking human being in a group when many people walk the100 meters wide of boulevard. However, it is called into question where the child with a red cap is and does it when we look hard and found the child. In that case, which one is “a person” or “the individual”? According to Meikyo Japanese dictionary, “the individual” is the each human being that consists of a certain society and group, or one human being who left the public status, or a private citizen. On the other hand, the explanation of “the person” has five items. The first explanation is Mammal to be vested in primate order hominid in animal taxonomy. The science name is Homo sapience, and the human being or human. The second explanation is an authorized individual, or the individual whom applies a constant condition. According to Kojien Japanese dictionary, it is “individual” with a person of severalty constituting a nation or social group, and a single person, or a one person, or a private person. And there is the explanation of 11 items about “person”. The first explanation is the same as Meikyo Japanese dictionary. My understanding is that “the person” is used with the meaning of the animal taxonomy in the dictionary widely. And the other hand, it is used in a human being of one of the severalty about “the individual” too. When it is said why I watch the difference between “individual” and “person” closely, it is because I am interested in the movement of the current constitutional amendment. For example, “all of people shall be respected as individuals” in the existing constitution Article 13. However, it becomes “all of people shall be respected as persons” according to Liberal Democratic Party constitutional amendment draft. I do not become with a wonder why it is that they change “the individual” to “the person”. Is the word “person” convenient for them to change the sovereignty of nation, a position, and a right in the Japanese constitution whom we have now? My doubt of these just deepens. Ms. Shoko Egawa of the journalist titled it “before getting on the amending the Constitution bus” in Yahoo news dated May 3, 2013 and explained this issue as follows. In this case the nation is not treated as “an individual” recognizing an each person’s difference and it is incorporated in the chestnut which there is it with a comprehensive “person”. As for it, the weight is put in the homogeneity as “the person group” than a personal difference. Therefore I checked the Liberal Democratic Party in question explained this difference. However, it did not have the explanation in their “constitutional amendment Q&A”. I imagine it about a constitutional amendment draft of the current government in this way. For example, the national flag and the national anthem which the present constitution does not have are founded in Liberal Democratic Party constitutional amendment draft Article 3. And the national flag assumes “Nissyoki” or flag of the rising sun, and the national anthem assumes “Kimigayo” or Reign of Your Majesty. Japanese people are demanded the respect for national flag and national anthem. Include me, there are people feeling resistance in singing “Kimigayo” in the Japanese citizen. It is because it is not good for this country of the sovereignty rests with the people because “Kimigayo” praises the Emperor system of Japan as an Emperor hymn. I doubt whether the right of the person who does not want to sing is accepted by Liberal Democratic Party (LDP) amending draft under any circumstance. One sentence “to be against the public interest and public order” in an amending draft is inserted. I felt an intention of government which this one sentence weaken the sense of rights of the nation and is going to bundle the nation to be strong. Therefore they might rearrange an individual to person when they took such a thought of the government because they could respect each nation in no case. I think it. How does everybody feel it? The question is whether it is good for us. I think it is no good. When we express it by oneself, we citizen does not perform violence, and each one obeys a law in a way for oneself. We respect the public welfare and, so to speak, work on our work. Current we have a good environment that we can express our self-assertion freely, and we can live in the environment where “an individual” so-called like me is respected. I think that the present constitution guarantees our freedom of expression enough. I want to let the next generation enjoy this freedom. I feel that each one cannot show one’s personality and interest enough in the society where it is intended to change “an individual” into “a person” at time when I think so. I think of Jesus who looked around to find the woman that it is good. Through the attitude to try to find one human being, Jesus teaches us how important is one human being for us. And the person who felt that a person is taken good care of will come to take good care of other people. I always want to make a model of Jesus. We must make the society where an individual is taken good care of. Therefore present constitution Article 13 that “an individual” is respected more than “a person” practically and concretely is necessary. I never want to rearrange “an individual” into “a person”. We have two generation neighbors that are the same generation and the next generation. Both them are on the week position. The same generation is the young people who do not have the right to vote at this time. And the next generation is people born in this country in the future. We live to receive expectation from these both neighbors. We are, so to speak, fellows together. I want to realize the wish that we heard from those neighbors in our way “now” and “here”. I want to send it to readers in this thought from now on. Thank you very much for your reading. The some gatherings of the Tohoku great disaster, a big earthquake, a massive tsunami, and a Fukushima Daiichi nuclear plant accident, were held in the Hiroshima city around the second anniversary March 11. I participated one of the gatherings in conjunction with Fukushima nuclear plant accident while thinking of people suffered from the great disaster. And I would like to write what I felt about that. There was an opportunity we invited the person who worked for the Board of Education of the Fukushima prefecture as a lecture, and to hear to the stories that it was under present conditions of the support to high school students. After his lecture, I asked him following questions about children of Fukushima. As for it, do they in how much conversion annual multiplication space radiation dose now? In addition, what kind of attitude are you for about it in the Board of Education? I am concerned about of the space radiation dose very much. I can read the data of prefectural office cities of the whole country in Mainichi newspaper every day. When exchanging the space radiation dose in the Hiroshima city of March 11 this year to numerical value of one year according to the data, it was 0.68 millimeters Sievert. We have not exceeded numerical value of 1mSv in Hiroshima for these two years. On the other hand, it was 7.1Sievert of approximately 10 times than Hiroshima city in the Fukushima city on the same day. I think that it “will be terrible leaving” now in future that children and adult people must live in environment more than 1mSv. The permission radiation doses in Japan were less than 1mSv in the general public area before the nuclear plant accident, and it was less than 5mSv in the radiation management areas such as the X-rays facilities of the hospital. It is said that many children are exposed to radiation more than numerical value of 1mSv of the maximum permissible dose or 5mSv in Fukushima prefecture for these two years. Even if the inside is at increased risk for being exposed to radiation through breathing and food, it is said the outside numerical value of the outside radiation exposure radiation dose is high. It is exposed to low dose of radioactivity inside radiation exposure by a radiation material taken in the body by breathing and food. There is an image in commemoration of the girl who died of leukemia after radiation exposure by the A-bomb throwing down for ten years in Hiroshima city. Healthy damage such as the breast cancer with the depleted uranium shell which the United States Armed Forces used ten years after that Iraqi War is conveyed from Iraq now. What will happen to Chernobyl now? They are anxious about healthy damage caused by the radioactivity very much in the Fukushima prefecture, and there are some school teachers wrestling for a present conditions breakthrough for the health damage for children in particular. They demand a present condition breakthrough from the Board of Education strongly because they think in the school teachers, but there seems to be a case standing alone without their thought knowing it in the authorities. Such teacher seemed to do outside the prefecture emigration with a family out of necessity for the safe environment. The lecture answered it with a state of the sorrow for my question by the opinion of the authorities, “the prefecture Board of Education was not the decided numerical value that annual multiplication space radiation dose 1mSv affected the health now”. I visited Fukushima city the way home of the suffering support volunteer of Kesennuma on December 8, 2011. I had an experience of my having walked around Fukushima rail road station with a mask and a rain coat for fear of my internal radiation. I wrote my impression at that time in the homepage of JMF as follows. “It was a slightly 5-hour stay, but I have been tired for the strain because I walked just what so that I myself did not take radioactive materials in the body. And I felt me to be, when if I continue such tension forever, I cannot live in this town.” I am anxious about civic life that must live in this area after the nuclear plant accident. As for what I pray for, people are not bewildered to less than 20mSv that the government shows a permission radiation dose. I think even 1mSv to be dangerous so that we live. In addition, I worry that it give a sense of relief to the government, companies, administrations and scholars which are called so-called Japan’s Nuclear Power Village because people recognize high radiation dose. And I anxious about a lot people who have a disease developing and standing alone mentally. ※Japan’s Nuclear Power Village is ridicule or a term to call with criticism with the special group and relationship comprised of a corporate enterprise, government or bureaucrats, a research institution of university linked by a right and interest about the nuclear power generation. 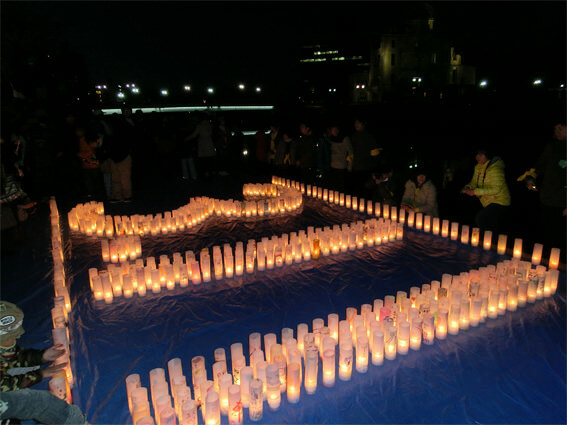 The gathering of the candle by the citizen was performed on the Motoyasu-river-Shinsui-terrace of the east side of the Hiroshima Peace Memorial Park in the evening of March 11 of the earthquake disaster second anniversary. This gathering did not forget victims by a major earthquake, a massive tsunami and the Fukushima nuclear plant accident, and we were performed by a wish that continued every possible action by one’s power without keeping silent for them. “The JUNOD” of Hiroshima supports people with the healthy uneasiness of the person with radiation exposure by the Fukushima nuclear plant accident. On Saturday, February 16, one family with three people from the Kanto district, and on Saturday, March 16, two families with six people including a preschool child living in the Okayama prefecture and Hiroshima prefecture that originally emigrated early from North Kanto area, and they consulted a doctor with radiation exposure treatment specialist of the Hiroshima city. They told that they would make an effort in keeping their health in reference to the advice of “the JUNOD” in future. I was made to think to hear a hard luck story of the life of people moved to Hiroshima from Kanto area. They have various problems. Husband and wife want to leave their child with a public nursery school and they want to work, but they must do resident registration to the city hall for that. And they also cannot receive the administrative services from the city. On the other hand, they do not want to move the resident’s card from the thought that was return to the hometown sometime, but the administrative service holds feeling regret that is not received if they do not move it. There is the difficulty of finding employment in the unknown place for them. They hold stress by the strain that occurred with relatives and acquaintances staying in the hometown, and as for them, there is the uneasiness living a life without being able to picture an image in the future. They have the feeling that wants to return to the hometown with a child, but the foot fades away of the radiation inspection system to school meal ingredients performed in Fukushima. Two years passed from that great earthquake disaster, but we want to know what kind of things are up now in a local family around Kanto area, the workplace, the community not to mention the stricken area spots. We may not hear the voices from people suffered from unless we take action so that we ourselves know it while thinking about such things. The problems of people suffered from do not decrease and becomes more serious. What we do not hear their acute voices and bear is because government, local administration, media and TEPCO want to conceal the acuteness. I think following numbers seems to be a main cause of Fukushima nuclear plant accident. According to the report of government’s Reconstruction Agency, 154,000 refugee of the whole Fukushima prefecture are, and outside the prefecture refugee is 57,000 people. We have to add the refugee from Kanto and other areas to these numbers. Why did each of the refugees choose to evacuate? They think that there are all circumstances that are to stabilize their life. Readers! Let’s make the social atmosphere that people evacuating to each place of the whole country feel relieved, and can talk about their present conditions. Therefore I think that we continue being interested in Fukushima nuclear plant accident at first. I think that attention is necessary enough for a re-appearance of Japan’s Nuclear Power Village parallel to these problems. In part there is the issue of energy policy of the Abe government which pitched again. This government dismissed a citizen’s group member, the committee member who clarified high cost of the nuclear generation and renewable energy promotion committee member appointed in the previous Democratic Party government by the council for energy basic plan, and it is reported that they added the nuclear power generation promoting group and the governor of the nuclear power generation location local government instead. We have a mission to make sure of an intention of Abe government. Readers! It will prevent you from forgetting what we know and to have thought by that great earthquake disaster two years ago. And we will raise a voice when we judged that a policy of the government is not good. We are expected from two neighbors, which are the same generation and the next generation. We want realize the wish that we heard from the neighbor in the way of us style “now, here”. I want tell you readers in my thought from now on. Thank you very much for reading. It is a beginning in 2013. Happy New Year, everyone! I hope you will reach new age in good health. When this year is over, I want to send a day on a day to be able to say for good one year. The following is an extract from New Testament Luke Gospel tenth chapter. I think that it is rare that we feel need to look for our neighbors when we live a comfortable life among our families or close friends. Rather I often think that there are many what is given it from people to meet in our everyday life or an event to face for the question whether I am the neighbor of other people. We watch the figure of a person knowing including myself among the priest and the Levite who came out the Bible. Or we watch the figure of a person knowing in a Samaritan. Will not it be such us? We will have the choice of the way of life that we become a neighbor for nobody, but I think that then becoming tasteless as for the life. Besides I think that other choice does not exist because the human being is existence living between the horizontal relations called the same generation and the vertical relations of the generation with the front and the back. It was with an opportunity to think about the experience of November becoming the neighbor of the persons with Fukushima nuclear plant accident radiation exposure for me and it being to the neighbor in the generation when the experience of December was born from now on. How many will there be people who are emigrate to the whole country by Fukushima nuclear ant accident to still avoid radiation exposure with spreading radioactive materials? There are people who receive radiation exposure medical treatment in Hiroshima receiving support from “the Junod” with headquarters in Fuchu, Hiroshima in those people. We lodge the family of the medical treatment in my home to support this program from the side. I want to tell you about their stories obtained by the interchange with them paying attention to their personal information. On Saturday, November 17, five three families are living in Okayama prefecture, Hiroshima city, and the Okinawa prefecture had a medical examination on that day. I mainly interchanged with the family from the Okinawa prefecture. 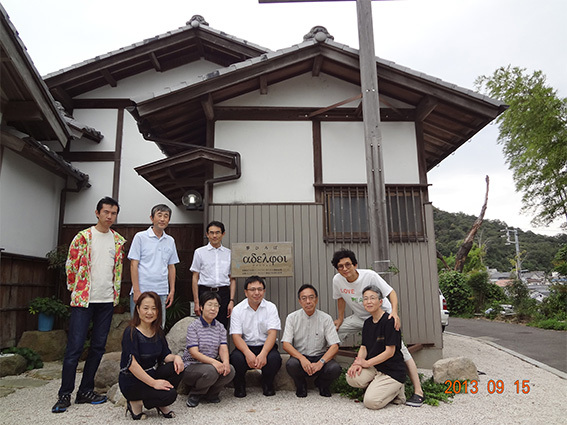 The family was from North Kanto and they moved to Okinawa via two places of refuge places in 2012 from March 2011. They told that there were the following subjective symptoms about a change of their physical conditions. Readers! We always jeopardized the radiation exposure every day by from the atmosphere and food to have mind read my stories. The symptom that was common just after their refuge was the tiredness of the body, fever, diarrhea, an itch of the skin, and sense of incongruity of the throats. Furthermore, diarrhea, fever, a nosebleed follow their later symptoms. In addition, they seemed to feel a pain of the knuckle joint and to have a chill depend on an individual. They also talked about the symptoms such as hair loss, an itch, a rash, and the bruise. On Saturday, December 15, five two families had a medical examination from Kyoto and the Kure city on that day. The doctor explained the things which created symptoms, and which part of the body anything, radioactive material was taken in for each one after a medical examination. Furthermore, he explained the actions to be taken for those symptoms to them carefully. “The Junod” continues the follow to consulted people in consultation with the medical attendant and will perform it. ※Look at the homepage or website of “the Junod”. It is two years from Fukushima nuclear plant accident already in another two months. The life of people turned big by a nuclear accident. For example, the people who wait for time of the return to their hometown in a refuge place, the people who were not able to rebuild their life in their hometown, the people who decided not come back to the hometown, the people who continues living a family parts, and so on. There are many people who not only the stage of the life changed, but also spoil mental and physical, and there is it. People who we met this time had an uneasy feeling whether it improved while feeling that the physical condition was not desirable and did it counting on a doctor who treated A-bomb victims for many years of Hiroshima all the way. Half of people treated for November and December were children. Fukushima nuclear plant accident will be deeply impressed what a cruel influence on their soft heart. I think that the situation does not improve for the better even if we remain silent. The Fukushima nuclear plant accident was recognized as “a man-made disaster” in Diet Accident Investigation Commission. Of course, as for persons concerned with electric power company which caused an accident apologizing, it is necessary to receive “hand thickness medical care not to lose time” and “compensation” because all people who suffered and damaged above all restore their life and health. It must be carried out immediately to a minimum. However, I think that probably the people called to be an assailant do not do the action to these practices positively. The public medical support to the people that it is strongly accepted influence of the radiation exposure is continued, but there are still many people that it is not received medical support even if it passes after suffering for two years in whole country. Not only the delay of the victim’s support by the government just have begun, in authorization of past persons with radiation exposure protection, pollution and the harmful effect damage, the record of the trial that competed against many victims between assailants show the delay of those measures to us. When we overlook that the health condition of various places exposed to radiation is not desirable, and there is it by indifference, an atmosphere of “tolerable limit” of people spreads over the society before long. Then it will come to have a loud voice, “please endure the poor physical condition,” and notification of the government, “the unbearable person submits the documents which clarified grounds that it is caused by the symptom and radiation exposure” comes to get by. I wish that my thought like this is my partial imagination. As for what I pray for, the radiation exposure symptom by the nuclear plant accident is not underestimated. These underestimated leads to re-operation of the existing nuclear power generation and new enlargement of the nuclear power generation. It will be terrible with what. A shock and the lesson of that Fukushima nuclear plant accident become already equal in nothing there to come. ・and they want you to understand acuteness living a life to emigrate while having uneasiness in the future. I convey the voices that got from an encounter by their homestay to my home for my readers and the people of the circumference from now on. The second report is “You must not be adjusted to this scene”. Do you think that I took these two pieces of Photographs wherever? 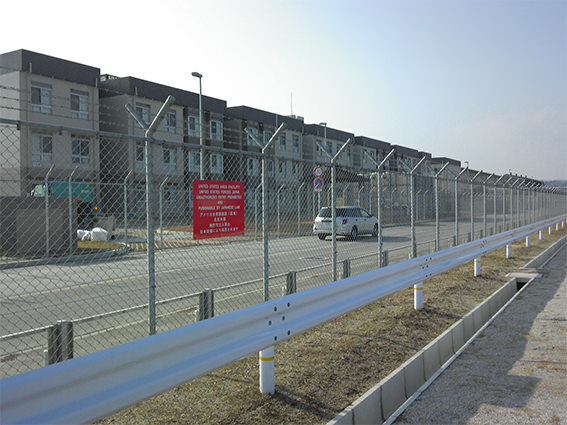 These pictures were taken over the guardrail of the Iwakuni Kintaikyo Airport’s parking lot which opened on December 13, 2012. Taking off and landing Tokyo Haneda flights of four round trips a day to use the U.S. military Iwakuni Air Station from this airport. ※This is Marine Corps Air Station Iwakuni, and is a United States Marine Corps air station. The American first occupied the base in 1950 to use it as a springboard for aircraft heading to the Korean War. You can see the houses and the institutions of the U.S. military officers over the border of barbed-wire entanglements from the airport parking lot. I did not realize the trouble of people forced to the life side by side with the US base in Japan including Okinawa when there was not this experience. Besides, I am sorry for the state of the US base where “the security” of we nation is like this that it is maintained in becoming it. Do we continue such situation forever and will be good? While I took these photographs, the landing and taking off training with the U.S. military planes were carried out several times. They secure our security with heavy-armed soldiers, weapons, and ammunitions. Something may be different from a human valid premise in this. After all we should as a human being making relations to reduce the armaments for interchange, talks, cooperation each other tenaciously. We demand politicks to try to be able to lower a deterrent not relations to compete for deterrent of the war. Our country pushes forward the maintenance of the strong national defense power steadily until now, I think that there is one side that built the friendly relationship with China, North Korea, South Korea and Asian countries on a shield of power, balance, and a deterrent. However, will they be good in future towards this direction? Does not this course become arms race practically Japan and Korea, Japan and North Korea, Japan and China without the end. In reality, it may be said that they gradually bring the crisis of the military crash. Our country pushes forward expansion of armaments more, and I think that insist on the need of “the nuclear armament” to be opposed to the nuclear power. Thus will you be good? Japan experienced miserable wars until now from the Meiji era through the Showa era. We should have learned how war was a stupid thing from these wars. We have to create our country in making use of these experiences, but the Japanese government fixes “expansion of armaments” at the root of the policy. We memorize former wars and have a duty recording it, and convey stupidity of the war in history. Therefore we must work hard to reduce US bases and the Self –Defense Forces of Japan. However, citizens use Iwaki Airport extremely for granted now. The importance will be a thing becoming higher more and more. 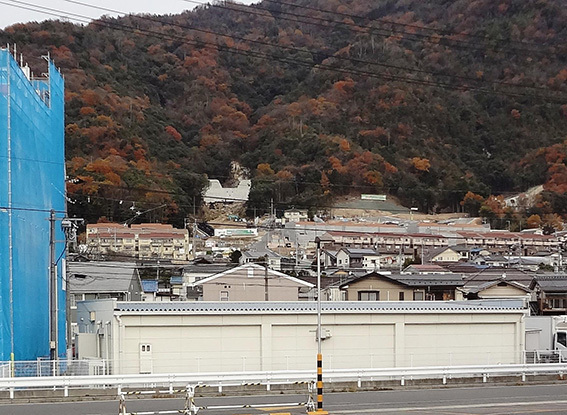 That’s why existence of the Iwaki US base will adapt to as some civic lives for granted. “The Iwaki Kintaikyo Airport” is the opening of a part to accelerate the mutual prosperity over the fence with we citizen and the US base. We must not be adjusted to this scene in these pictures. Citizens of Yamaguchi and citizens of Hiroshima will mainly use “the Iwaki Kintaikyo Airport” in future. Therefore, let us abandon proper consciousness with a US base. And we will take some actions so that a base for war disappears early. Then it begins to change not to move. We can give the neighbor of the next generation the peaceful world without the war by doing so it. There is the word neighborly love, but it is to regard people in the next generation as our neighbor. And we confirm it what people of the next generation expect from current us, and we have to keep it alive in our actions and choice of things. ・Exterminate health hazard including radiation materials. ・The society which they can secure the work place, and they can design in the future. ・Minimize the debt of the country, and society with the safety net for the weak. ・Demanding deepen peace and the friendly relationship with Asian countries and the other countries, and not having armaments each other. a loss, be oppressed, and be knocked down” (2 Corinthians 4:8) in actuality. It will not be an easy thing. However it is what we are concerned with in the generation of children and grand -children and great- grand- children that we are important in these and the trace. I think about growing my back, and what the next generation expects, at first I want to do it on each day of 2013 to wrestle because I can do it of my own. We are living and are expected by the neighbor of the same generation and the next generation. It is so to speak, a fellow. We want to come true in the way of our style “now, here”. Thank you very much for your reading and understanding. It began to change the colors of the trees in the Peace Park of Hiroshima. It is the coming of autumn. How about where you everyone lives? This is a seminar report of “The Wind from Hiroshima” which gathered together under the 6th “Mennonite” and “Hiroshima” holding in September this year. I thought it was a seminar for me, how we live the nuclear age, and the age of the contamination caused by radiation after the Fukushima Daiichi Power Plant nuclear accident. It is a slightly long sentence, but please read. I think that I serve as reference in making the way of living and the health of readers. This seminar featured the theme of “us whom we would do what for the nuclear use” and was held from 15 to 17 on September. The people from Mennonite churches and one person from the Catholic Church participated in this seminar. We carried out two open lectures or witnesses; one was a lecture of Mr. Tatsuya Aoki which evacuated from the Iidate village of the Fukushima prefecture, and the other was a lecture of Mr. Hitoshi Kai who is a representative of “the Junod Society” which supports radiation exposure citizen of the Fukushima nuclear power plant accident based on support experience of the healthy improvement of a victim exposed to radiation by Chernobyl nuclear plant accident. “The Society of Junod” is a citizen group of Hiroshima working on persons with radiation exposure support of world nuclear victims, particularly the Chernobyl nuclear plant accident. Approximately 15 citizens participated in these lectures. The name of this society is associated with Swiss medical doctor Marcel Junod (1904~1961). He was the Red Cross doctor who personified “the spirit of the thing” and he was the first foreign doctor to visit Hiroshima after nuclear attack by the United States on August 1945. And he also treated patients and sent 15 tons of pharmaceutical products to there after the devastating. “For God loved the world so much that he gave his only Son, so that everyone who believes in him may not die but have eternal life”. (John 3:16) I believe that these words are what are inherited in to our times and a future generation from the time of John. We who live in the world that is the world are loved by God. Because it is us who are loved, will not the person accepting only child Jesus be that it which meets God loving the world gets everlasting? And the disciples of Jesus who knew the thought of God become to love people living in the world with God. Will it be to live what kind of life concretely that we love people living in the world? I report three points that I learn through this seminar for this question and thought about. At first, as for the first point, I live in remote Hiroshima nuclear power plant accident, but possibly I might be already exposed to radiation and may be exposed to radiation now. Furthermore, it may be said that I myself am exposed to radiation after this. Therefore I want to make a strong body and a life style resisting radioactivity to work in the world. That’s why I began the learning of the material taking out the radioactivity which I got into in my body. Do you have thought that you were a person with radiation exposure? After having finished a volunteer of the relief supplies distribution to the temporary housing of the Kesennuma city in last December, I was worried about a state of the life of the Fukushima citizen on the way to Hiroshima and wanted to check it with my eyes about the radioactivity decontamination of the place where children including school grounds and the park gather, and I walked around the Fukushima city with foot by bus from the morning to the evening in December 8. I wore a mask for a cold, but think that probably I breathe in radioactive material drifting by a radiation to fly in the space, and I also breathed in the radioactive material which drifted between the sky, and the inside was exposed to radiation. I will be I was exposed to radiation, and have had a similar experience because of walking around Tokyo the next day. Not “how much” that “how long” was exposed to radiation, I want to put my matters that require attention in “having been exposed to radiation”. And they had been already started in the store, and part seemed to be already sold, and the mushroom of non-sail was collected from the store after the detection in a hurry. When the thing exceeding the standard value that government decided circulates to consumers as for the polluted food by diffuse radioactive material by Fukushima nuclear plant accident to hear this news, and I think that it is sold consumers to be it without suffering from mesh of a net of the inspection, I think that we may have been already exposed to radiation before we notice it by eating such a thing. The government says that it is only foods less than the standard value that country decided to be sold, and there is not the influence on health promptly if you do not eat successively in larger quantities even if polluted, and in this case there is not it depending on a thing of the quantity, and I put weight in eating, and I think that myself is exposed to radiation. Even if I who is very healthy will get sick in the future and developed in a healthy obstacle, there cannot be the thing that it is proved by the government or Ministry of Health, Labor and Welfare when the cause is the radiation that radioactive material taken in the body releases. When it becomes so, I am going to assert like that like that ……however. Therefore, I oneself was already a radioactive exposure or it may be exposed to radiation from now on. Anyway how should we have started the radioactive material which was the toxin which was in the body before developing in a disease outside a body? How can even the body which has been already exposed to radiations hit the power of the body which a disease does not develop in? The practice report was made for such questions by Mr. Hitoshi Kai of the Junod Society by this seminar. This is the practice that we wanted to work on by all means in making a body resisting a radiation. I am going to call people of the circumference to practice it together from now on. The Junod Society hands it to people with radiation exposure of Fukushima hoped for acquisition of a set of a plum, a stinking noxious weed, miso and the medical application from last year for free. Replies of the improvement of the health arrive from the people who received them. The Junod Society began in 1988 two years after the Chernobyl nuclear plant accident as the organization which supported the health of the nuclear plant accident victims. Thereafter it is “a plum and a stinking noxious weed, miso and medical application” that was proved by practice to follow the health of the nuclear plant accident victims for 24 years. All these are our imminent foods. Don’t you try it as the food which is good for a body for the reason of readers protecting your health from radiation exposure even if there is not it? I recommend it to you. ※You can look at the activity to search it in “the Junod Society (Fuchu, Hiroshima)” on a homepage. You can do participation about action to protect the health of the victims by the Fukushima nuclear plant accident. I begin with the matter to have. Please refer to Ishiya. The second point is that a tool creating peace cannot the existence include “a nuclear weapon” or “the nuclear power generation”. Because a nuclear weapon is weapon of mass destruction to life and it is because of making much radiation exposure victims. This is world common sense. “The nuclear power generation” makes steam by heat and steam turns a turbine and makes electricity, but it is world common sense that continues producing waste starting a radiation in total. Radiation exposure witness Mr. Mitsuo Kodama by the seminar is exposed to radiation at the age of 12 years old in a junior high school building approximately 850m from the blast center in Hiroshima and he recovered after a two-month fight against illness by radiation damage, but would have the abnormality of a remarkable chromosome by a radiation. And he spends days to fight against cancer which he is over 60 years old, and occurred to a different organ now. Another witness Mr. Aoki is that a nuclear plant accident happened, and in the house where he lived in, it was that a highly concentrated radiation pollution area, that’s why he emigrated from Fukushima to Hiroshima with five families in last June, and they right push forward their life rebuilding now. Mr. Aoki is afraid that their children become sick under the influence of their living in Iidate village by June 1 from March 11 of the last year. I think that nobody can assert that the nuclear plant accident with the healthy damage caused by such a radiation never happens. The nuclear power plant is in each Asian country, and there is it in the world each place. Who of us Japanese can assert with safety there? When the tragic incident such as the Fukushima Daiichi nuclear plant accident occurs once, the radioactive material is carried to everywhere Japan under influence of a flow of the atmosphere and the seawater and pollutes fish and the soil, and not only local people but also we all Japanese will eat the crop and blessing of the sea polluted by radioactivity. In addition, it is thought that we are exposed to radiation by eating food imported from the whole world. The nuclear power generation that it is difficult for a human being to manage it, Chernobyl, Fukushima and a catastrophe continue. And I think that a human being must not have the use of the nuclear power plant because of giving radiation and continue to hold the nuclear waste product, like a nuclear weapon. The material which gives a radiation by all means if a human being is going to use a nucleus namely dangerous nuke waste is made. The safe management of this waste has only a method to deposit deep in the ground so that a human being is not polluted by a radiation. We must not hand dangerous nuke waste to descendants. I hear that the temporary safe keeping place of nuke waste becomes full soon. Furthermore, I hear the “Nuclear Fuel Cycle” enterprise which makes nuclear material plutonium from spent nuclear fuel if there is not yet foreseeing it of coming true. Let’s do “the business made with the nuclear waste which continues giving a radiation of the fear” to be already over in our time. And I think that we should wrestle already how deposit the waste which has made deep in the ground to reduce the burden on later generation now. I learned that we should not hands-off involving the life of our third point. First, I think that we understood each other, the importance of mutual trust each other, with that in mind, I think that we do not neglect to usually analyze information with critical posture against about the announcement of the government, remark of the experts and the news of the media. And then I think that we should learn precise information following: Is it true that they say? Is not it announced to be convenient for them? May they do not be yet informed of it to us? Are not there the different opinions? Much history that we citizen learned up to the present day shows the lesson how important it is to keep our life in us. For example, the following the things are recalled; the announcing the Imperial Headquarters which did not convey a fact at the time of the war of the Showa era, there having been the times when they did not recognize pollution as the responsibility of a government and the companies, reality not to change in a course to reduce even if a US base of Okinawa passes after return for 40 years, the Diet accident investigation commission concludes Fukushima nuclear plant accident to be “a man-made disaster” called atom village by Tokyo Electric Company and the persons concerned. In addition, the government, administration and experts delay the refuge of inhabitants by this nuclear plant accident, and it is clear to have reducing the refuge range. By the way, they are not taking the action that made civic life have top priority for politics, following inaction and negligence, slackness, an organization and the system to miss it, and it gets by to draw close near a person with power. 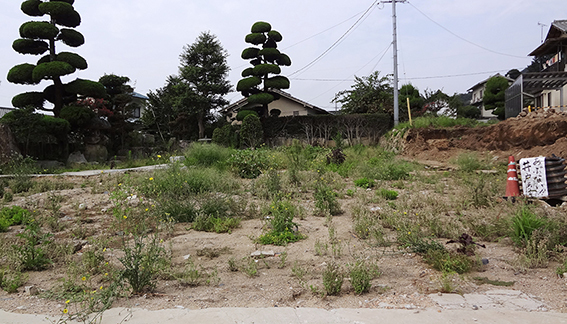 Mr. Aoki just waited for the evacuation directive from the government and the village authorities, and during until the setting of the premeditated refuge area by the government of April 11, he was talked about the useless regrets that had been exposed to radiation by this seminar. Why has the evacuation directive to the polluted Iidate village of the high radiation been late like this? I think it is terrible if it could reduce the confusion that the government than protecting the lives of citizens, and if there was a judgment that they could do it by evasion by responsibility on the pretext of that they could not prove the healthy damage caused by the radiation later. If is so; I think that the deep regret was beyond cure, but how do all of you think? At all events, I take regrets of Mr. Aoki like my thing and assume it a lesson and learn by to protect my life and obtain information by myself, and it is important at all to think about the action that we should take by ourselves. We do not leave that we keep our life to others including the government, administration and the experts. I was strong, and I thought so that one’s life must hand down that we protected it by oneself in a later generation. At the time of the great tsunami, there are most of the inhabitants including primary school children and the junior high students who practiced a legend of “tsunami tendenko” coming to the Sanriku district of Tohoku, and saved own lives. It is said as follows interpreting this as a disaster prevention lesson. If ”a tsunami comes, the take does not pay attention to blood relationship first of all either, and you are alone at all separately respectively, and escape each to the hill”, and “protect your life by yourself”. Therefore school children began refuge towards a direction high immediately before an evacuation directive was given by teachers of the school. It is the lesson that have been inherited it is alone, and to reduce a human being dying of a tsunami you determine where oneself runs away to, and to act immediately. We will make use of mind of “tsunami tendenko” shown on March 11, 2011, so to speak, “it is keep your life tendenko”. About what to do, you must wrestle with spirit so as to have been reborn we not forget the importance of trusting a human being, but to keep your life, our life and my life by oneself. We experienced a big natural disaster and also a man-made disaster as never before. I feel that we must not soak in a thought stop carefree of the leaving all to others to the full like that. Jesus answered. ”You must love the Lord your God with all your heart, with all your soul, and with all your mind. This is the greatest and the most important commandment. The second most important commandment is like it: ‘You must love your neighbors as yourself’”. (Matthew 22:37-39) Everyone, we will make thought for loving a thing, the neighbors who love oneself. I believe that it is to love God. It is that above three points were given as suggestions from these to my real life by this seminar. It was summer of too hot Hiroshima. Still it becomes around the end of August and comes to feel the cool early morning at night. Now will be the place of all of you? August 6 of the 67th year was on that day same Monday from that day. At 8:15 of the day of the beginning of the early week, already in the city center, inhabitants of Hiroshima and military men gathered from the whole country, and adults and children mobilized for (building evacuation) breaking housing, and to make large vacant gathered lot. In addition, many people left the mother country including persons commandeered from the Korean Peninsula and lived in the city at the time. These people bombed with an atomic bomb follow what leaders of the country decided. And they lost the future by atom bomb throwing down. 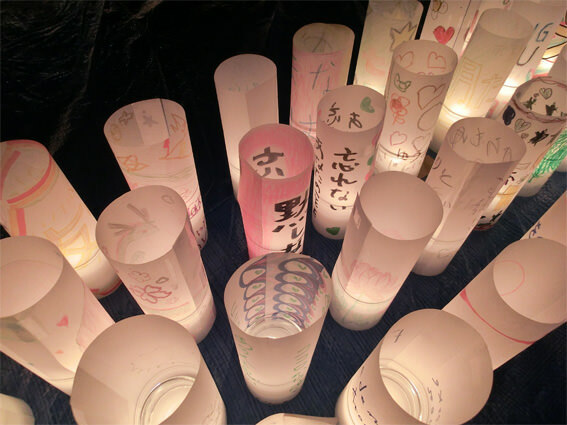 Many people prayed for nuclear disarmament and world peace and gathered in A-Bomb Dome and Peace Park this year too. I think that it is to make use of a past if we are going to make peace. If we make use of a past called the war at the present and are going to make peace, we act in obtaining extensive information for rolling it up to security, abolition of the nuclear power generation or promotion, or people of other next generation as sovereign by oneself and judge it from oneself, and we sometimes to go outside, and will not it be important to express one’s opinion for the government and city administration? It is to do from that we sovereign concretely to report the voice of the nation who is sovereign to politicians and the bureaucracy. When it does not mean that carrying out the responsibility to the next generation only in obeying what a country decided, I feel it to see the acting of the government and the nuclear power generation promotion side from Fukushima nuclear plant accident to Ohi Nuclear Power Plant re-operation. ※The Ohi Nuclear Power Plant is located in the town of Ohi, Fukui Prefecture, managed by the Kansai Electric Power Company. It is a custom our church members gather in the Motoyasugawa bank of river drifting to the east side of Peace Park in the evening of this day every year, and to pray for peace. Under the Fukushima prefecture, many people still live with having uneasiness of outside radiation exposure and the internal radiation exposure. There are people who decided “not to come back” to avoid radiation exposure in the refugee, people living assuming coming home in a temporary house and people who cannot decide it in either, and hesitate. In addition, there are separate people choosing among families. The pollution with the radiation exposure by the nuclear plant accident and the radiation material destroys the life of inhabitants and takes prospect of the coming life away from them, and even inhabitants calling oneself with refugees exist among them. It is that I cannot stand and is really serious as for the situation truly that there is it in this as myself same Japanese. We invite Mr. Mitsuo Kodama as a radiation exposure witness this year on the first day of this seminar too. We ask him about his step that lived a postwar life while having an exposure and disease exposed to the situation at the time of the atom bomb throwing down of “an atomic bomb, the Don” and radiation by him. In addition, we observe the peaceful museum and learn about the relation between radiation exposure does of radioactivity and healthy obstacle in particular. The radiation exposure by the nuclear plant accident progresses in Fukushima and has top priority in checking influence on citizen’s health, and this is a problem of the urgent need now. We invite Mr. Tatsuya Aoki who emigrated to Hiroshima City from the Iidate village of Fukushima prefecture to avoid the radiation exposure of a family, the child and, on the seminar second day, hear his story about the present conditions of the Fukushima Nuclear Power Plant victim. In knowing reality that inhabitants are forced to by a nuclear plant accident slightly deeply for our “nucleus” stand, and check a position, and will deepen it. In addition, after Chernobyl nuclear plant accident of 1986, we learn about the disease that a local citizen takes and want to know the influence on health of the inhabitants by the Fukushima nuclear plant accident based on this. Therefore, we invite the representative Hiroshi Kai of “the Junod Society” which performed medical support to Chernobyl nuclear plant accident victims from 1988 as a lecture and report the support situation in Chernobyl. In the Junod Society, they do activity to send “Umedomi” which is made of a pickled plum and a stinking noxious weed and miso or bean paste and works to enhance the excretion function of the human body, to make a place of the medical support and rest after Fukushima nuclear plant accident. We talk about our posture on the nuclear use as things mentioned above after having done the learning of two days. We prepare for proposal to think about this from a viewpoint of Mennonite. We want to share “Mennonite” and “Hiroshima” that participant each raises through discussions and interchanges while we share these learning. I read “the invisible cloud” which translated and was published by Yumiko Takada in Japan, which published in former West Germany in the next year of the Chernobyl nuclear power plant accident in April, 1986. This novel is the fiction which described several months when girl Hannah experienced it by a nuclear accident in West Germany. While losing parents and a younger brother, and it is helped by neighboring people while developing in oneself under influence by the radioactive exposure, the figure of the girl who begins to think about whether the human being can coexist with nuclear power generation is drawn vividly. It is introduced that this novel is read in Germany by many adults and children and becomes the teaching materials of the primary and secondary school by a translator. The scene remembering me most is the scene where grandparents talk with the girl who did not meet with a nuclear plant accident by having traveled several months after an accident. The grandfather who is not yet informed of leaving the girl and all the family died. He says, “In the first place it was a mistake to have told the media to what we did not need to inform. (Abbreviation) It has it so that hysteria occurs if they do not do even such a thing, and we did not need to be confused by an exaggeration and propaganda. (Abbreviation) Where is need to know the inside thing of the nuclear reactor and rem or Becquerel? (Abbreviation) Politicians if they keep quite this thing again, I think it must be done not aware of anyone at all, such as the accident even Schlitz surely, it would be better if there are some guys media to put their nose to the accident it to.” The grandmother nodded beside him while hearing it. ※Schlitz is a small town in the Vogelsberkreis in eastern Hesse, Germany. Hannah took the hat slowly, and she has begun to talk about from that day when she fixed straight her eyes on grandparents. For the words of the grandfather of this scene, I couldn’t but reflect one’s negligence that did not think about nuclear power generation, and Hannah said it, “negligence to such a social movement produced present me.”, her words that talked while wiping the hat which covered the head which the hair came out of in front of grandfather calmly were the scenes which right conveyed her real intention to her grandparents, to readers, and to me. In particular, I was thrust the importance of the thing at. In addition, it was the scene where I was a reader was considered to be the person concerned at one sweep. Through the whole, I am touched by a scene to pedal it by bicycle desperately so that a girl and a young brother escape from approaching radiological mixed clouds. The price of this book is for Syogakukan library of Japan is 780 yen. In addition, you can watch even DVD because it was filmed into a movie. ※”Die Wolke” written by Gudrun Pausewang (which is also available in English translation under title, “Fall-Out” in 1987), which has also been made into a movie. Among her favorite topics are environment problems, social and nuclear issue as well as the developing world. After reading, I have been back and forth around and around while around her afterword of the second edition translator Yumiko Takada of pocket edition June 2011. Until a day of Fukushima of March 11, 2011, Ms. Takada regrets what oneself would do it after her translate it in 1987 and publishing it. She was going to think about a thing whether the human being could coexist with nuclear power generation once. However ……. “I intended to keep the uneasiness to a nuclear plant accident in a heart, and my consciousness has faded with progress of the time. I thought that I must not forget to forger it some other time. Memory and consciousness always have to update them.” she reflects. I think that this reflection is not only Ms. Takada and is myself and decides in the future and must take this lesson to my heart. When I walk Peace Park and stand still in front of the A-bomb Dome, the place speaks to me by all means what it is. I feel that it is time when I update memory and determination. 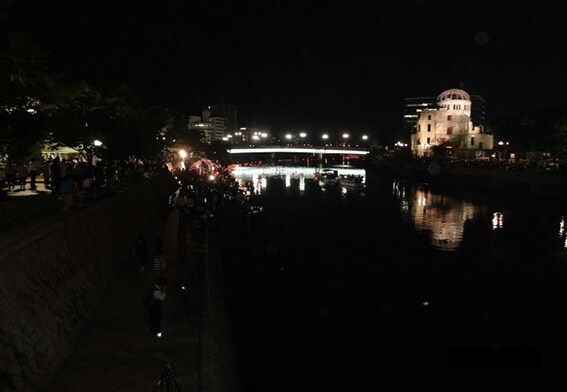 The persons who want to visit Hiroshima City among all of you who read the story on August 6 of this year tell you about the information of the atom bomb connection institution if there. Please inquire without reserve. Thank you very much for your reading my story. Hiroshima Report No.2 "Prayer for Peace"
The cherry blossom forecast of Hiroshima is April 1, but for how would you do your places? It has been one after to East Japan Disaster, and I think they had various gathering or meeting is the district of Tohoku or the northeast of Japan and all in Japan too. I heard a story of people who have been in the family moved to Hiroshima before last summer from Iidate Village, Fukushima Prefecture on March 10 and 11 this year. Listening to the story of the family, I was able to know the people living in the high radiation areas forced to tension and how hard their daily lives. I decided to find out how high it is compared with that of the Hiroshima radiation and of Fukushima radiation for that. Then I have tried to make a year in terms of the amount of environmental radiation in the atmosphere of the prefectural capital nationwide radiation monitoring information based on the Ministry of Education, Culture, Sports, Science and Technology of Japan has published a daily basis level environmental radioactivity survey results. This data is measurements on March 8 this year appeared March 11, morning newspaper Mainichi. For example, on this day, per hour, 1.115 micro Sievert of Fukushima city, and 0.084 micro Sievert of Hiroshima city. I was assigned in 1000mrem Siebert value calculated by multiplying this number 24 hours and 365 days. Fukushima was about 9.76mSv, the city of Hiroshima was 0.73mSv then. Although this is in terms of simple, given that limit the amount of man-made radiation the general public may be exposed to one year is 1mSv, continue to live in Fukushima and still, anxiety people who have been moved from the village Iidate feel they have not help but imagine the tension and anxiety of the people. On this occasion, how do you try comparing the numerical value of Fukushima city and live in own your city? I would like to imagine the feeling of people living under the influence of nuclear power plant crisis. 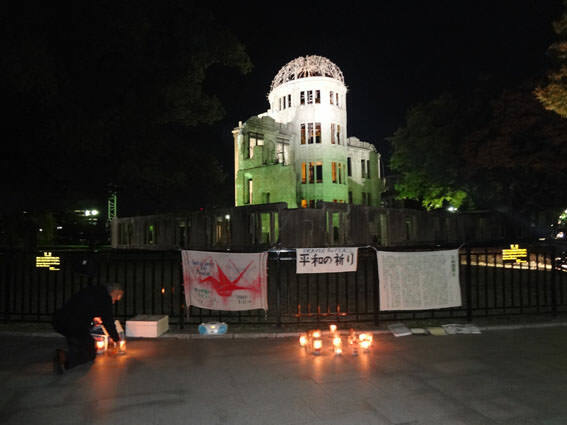 In the first report, after the September 11, 2001, I mentioned that the desire for peace by citizens of Prayer has been held in front of the Atomic Bomb Dome in every Wednesday evening. 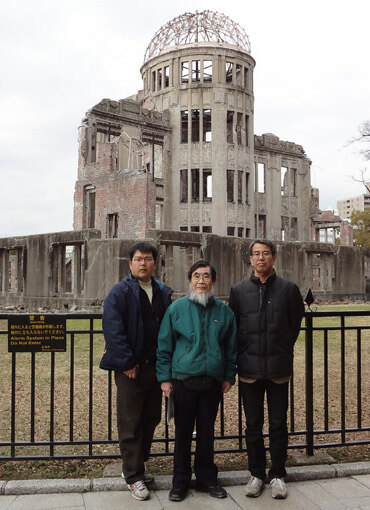 On March 19, we members of Japan Mennonite Fellowship (JMF) is set to Hiroshima, we talked about the relief assistance activities of East Japan Disaster in 2012. It is expected about this detailed report is made to the Mennonite church and BIC Japan church nationwide from JMF chairman at a later date, you also mention our web site. 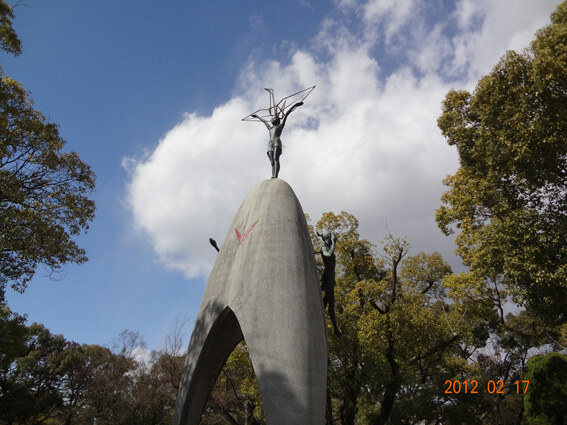 The day of the vernal equinox on March 20 the next day, I guided to the Hiroshima Peace Park JMF three committee members. 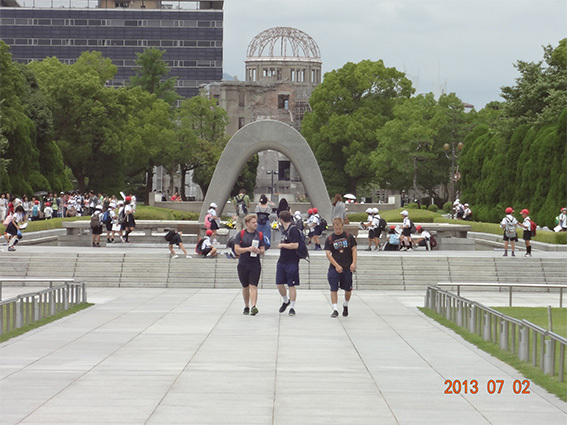 Starting from Atom Bomb Dome, I was allowed a description of the Child's Peace monument and other monuments in the Peace Park. during inspections, be exposed to radiation by the accident as"hibakusha" notation is also to be, something in three words inJapanese. ※We use two different Kanji or Chinese character and Katakana the word "hibakusha" in Japanese. Hibakusha literally translates "explosion – affected people". The "hibakusha" will be expressed two words in Japanese. One is a person who has received a direct attack on a nuclear bomb. Another is a person is not received the direct damage, but exposed to residual radioactivity associated with the nuclear explosion. We have now to bring back to each of these questions. Thank you very much for reading so far. So enjoy the trust to No.3 Hiroshima Report. Hiroshima Report No.1 "Prayer for Peace"
September 11, 2001, after the terrorist attacks using aircrafts to the World Trade Center in New York, we several citizens of Hiroshima gathered in front of the Hiroshima Peace Memorial or Atomic Bomb Dome and has started "the meeting of prayer for 30 minutes" at 6:30p.m. every Wednesday . unfortunately the war in Iraq, Afghanistan war, and the Middle East and North Africa such as the struggle for democratization, and the blood of many people in many parts of the world by force and violence. there was also a place importance the life of our irreplaceable. People of Japan and people of overseas came to visit the Peace Park joined our Circle of Prayer, they often spent meditation together with us the time only got the convenience of them, too. Some people willing to leave the words were good to have met in this place. I don't know when the coming of a peaceful world like we have hope. I am fully aware of the fact that the advent of that day is still distant. And that's why we have prayed that prayer so as not to wish while everyone in the world can enjoy the peace that endures, so as to widen the circle of prayer. the day of musical performance, and the day of interaction with travelers. Everyone who read this story, when you travel to Hiroshima, let us have moments of prayer together. Let us pray for peace!